Using a finishing disc I removed the mill scale off the main legs. These work great but are expensive for the time they last. I think I need to order in bulk! I had a go at polishing the bottom tree. This is black bar, to linisher, to 120g orbital, 240g orbital, then buffing wheel. There are still scratches showing so I’ll hand sand 400g & 800g then polish. Other plates are ready for that process now. 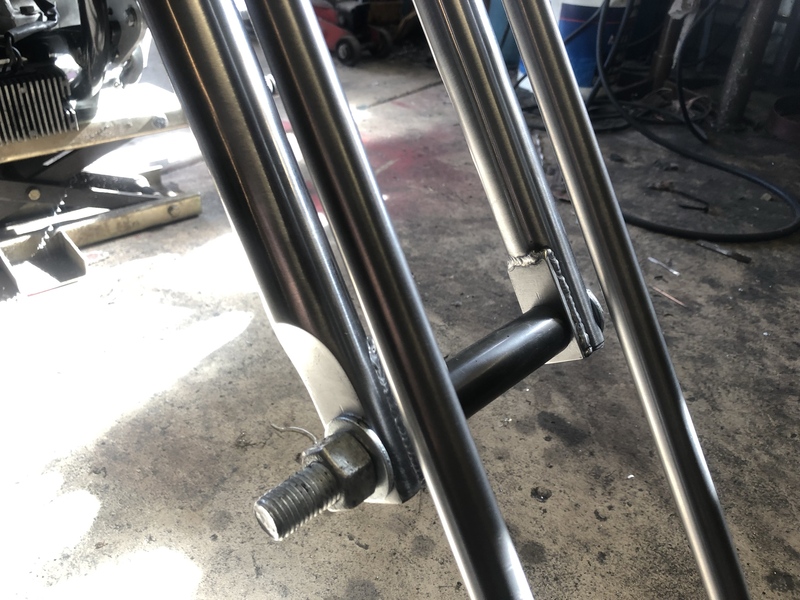 I forgot the show the top ends of the fork legs, this all had to happen before the merging of the two tubes. Here are the counterbored slugs for the top tree. 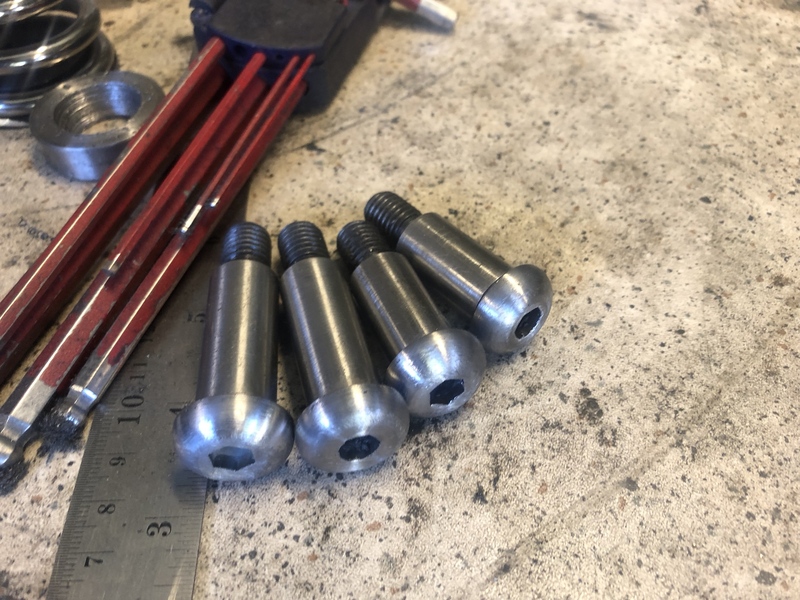 They are bored 16mm for the shoulder bolts, and also threaded to M12 for the threads of the shoulder bolt. 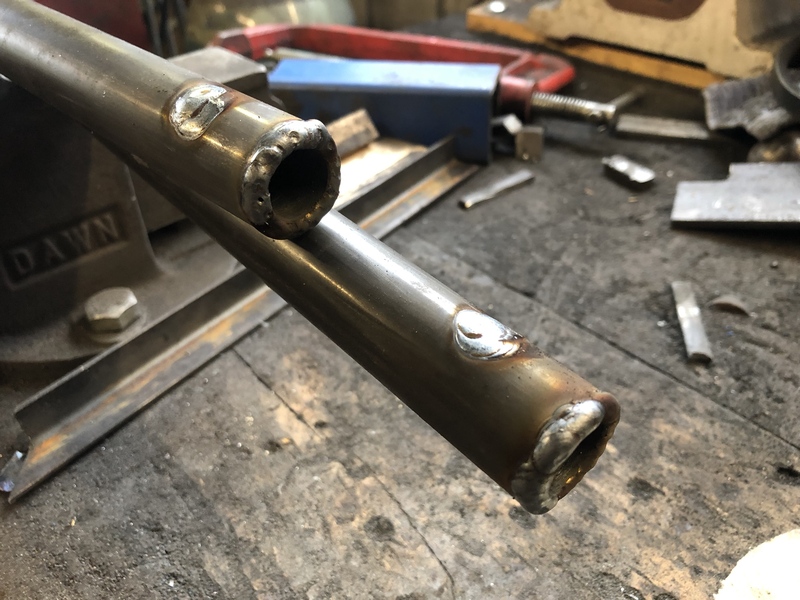 1” tube drilled for plug welds, and have positioned the slug to it protudes enough to weld around the end. Tapped into its final home. 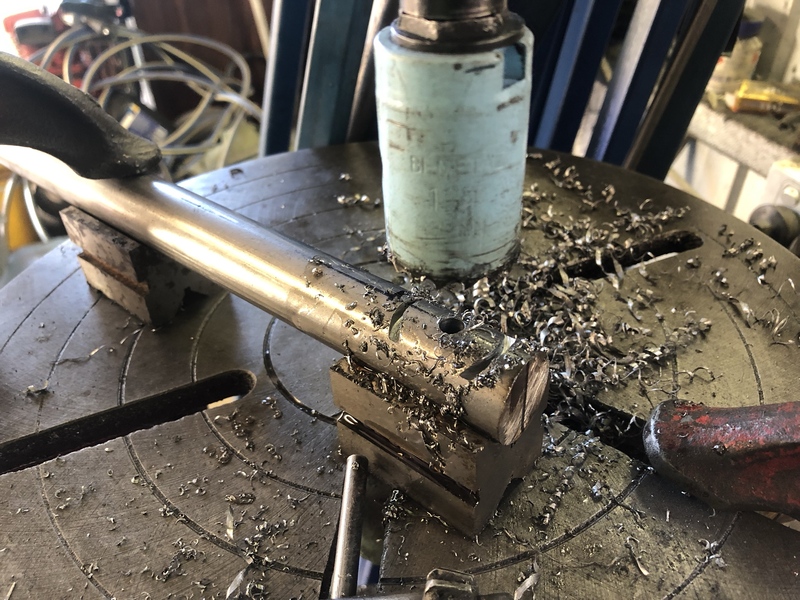 The bevel allows weld to penetrate in as deep as possible, as again any of the proud weld will be removed once this surface has been turned flat. This face sits against the underside of the top tree. 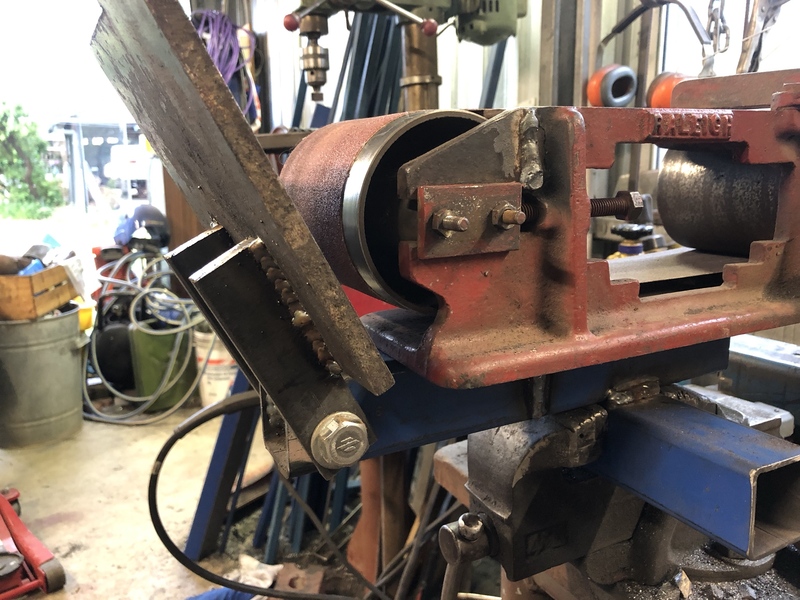 And finally, one of the reasons I think my twin-wall design is a good idea, as well as brazing joints to avoid any welding embrittlement/HAZ around the lower tree. 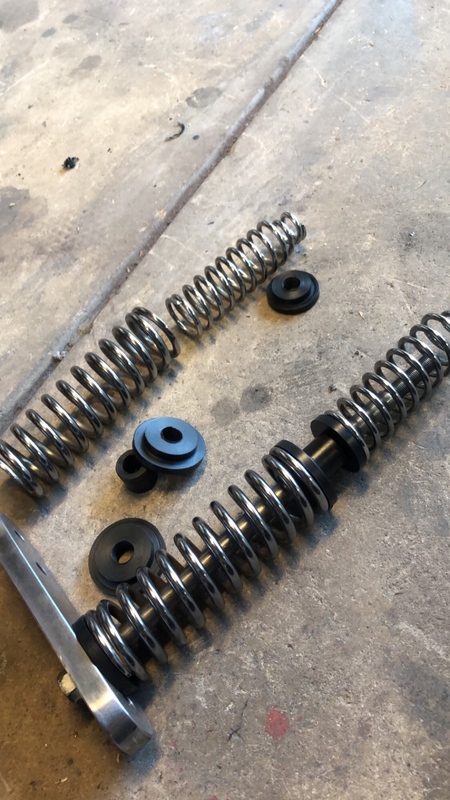 Spring seats and spring rod bushings machined out of Delrin. 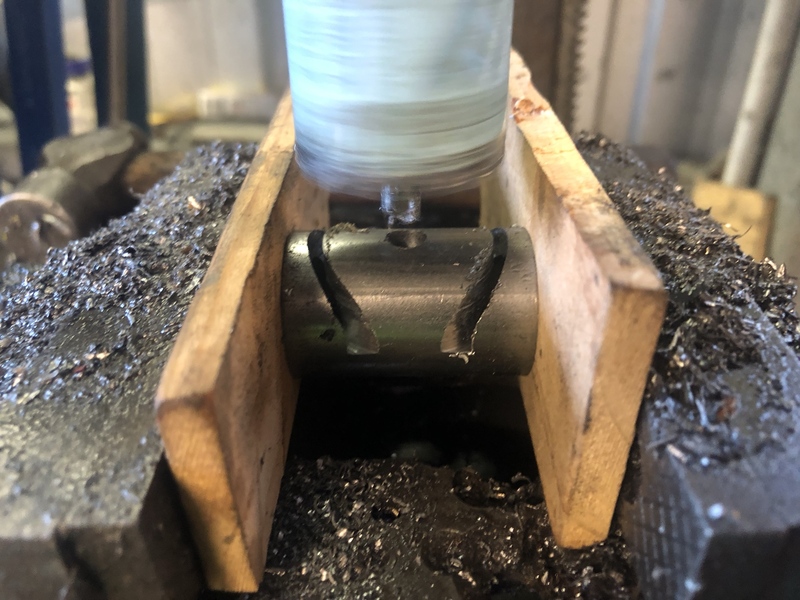 Bushes either side of the spring plate are counterbored to locate on the rod bushes, which sit proud either side by a few mm. 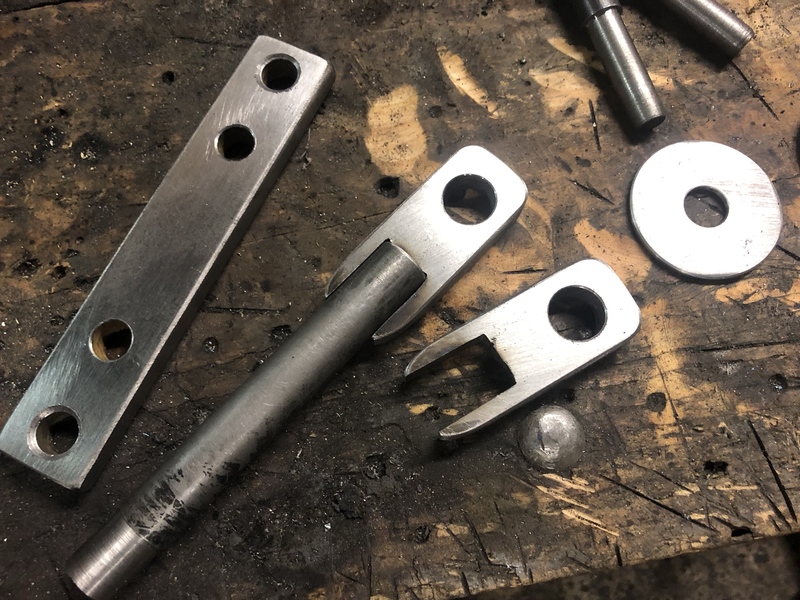 I decided to redo the dropouts of my springer, I wasn’t happy with the fabricated ends and the amount of tidy up and work required. They would have been strong enough I’m sure but I wanted bulletproof! Enter V2 of drop outs. 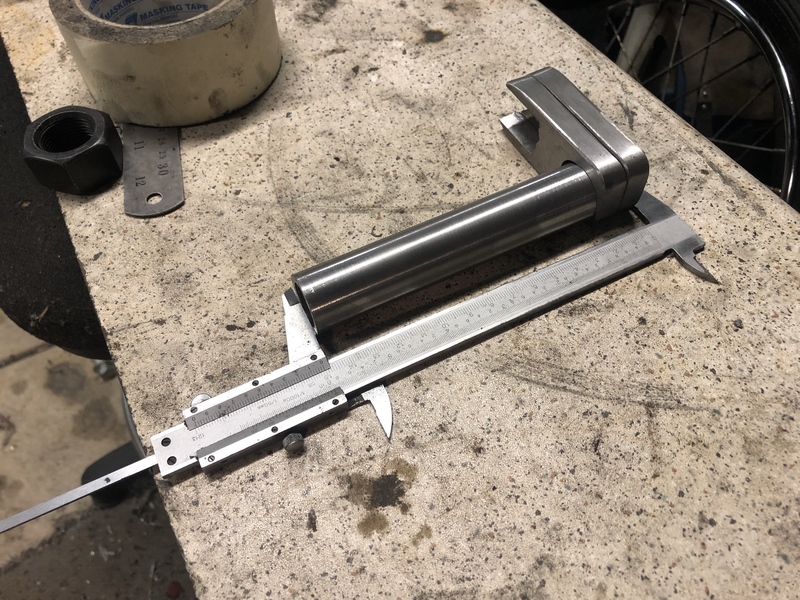 Built this angle adjustable table for the linisher. Very low tech and done in about 10 minutes from scraps. 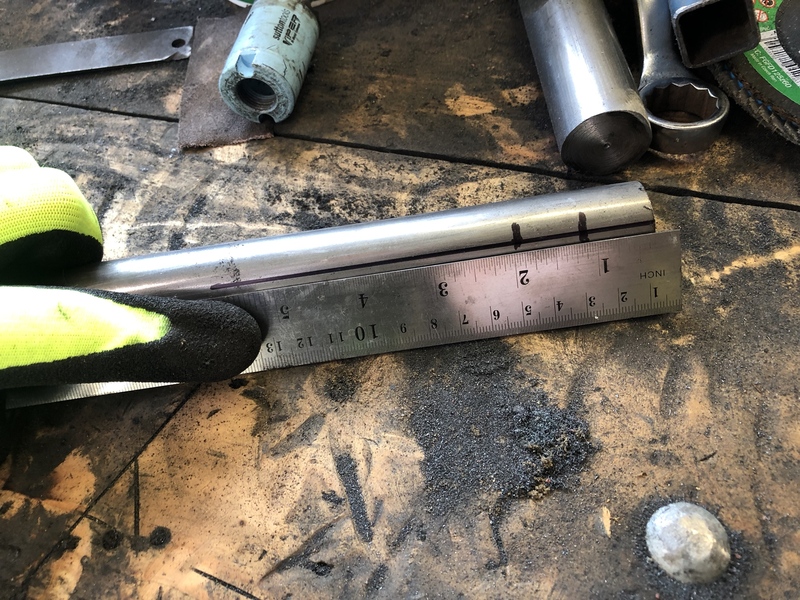 Next was to cut some slugs of 1 1/4” bright bar, same dia as my fork legs. 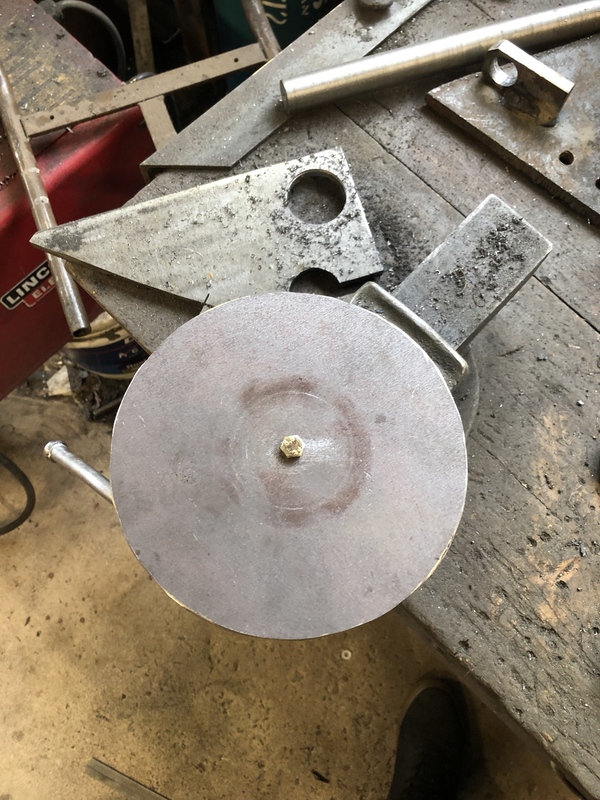 I set up this jig to help roughing the shape with the angle grinder and flap disc. This is how it all works. By adjusting the table minutely, and just taking off a fraction at a time with the linisher. The results looked great, ends like sugar bear’s springers and many other quality designs. 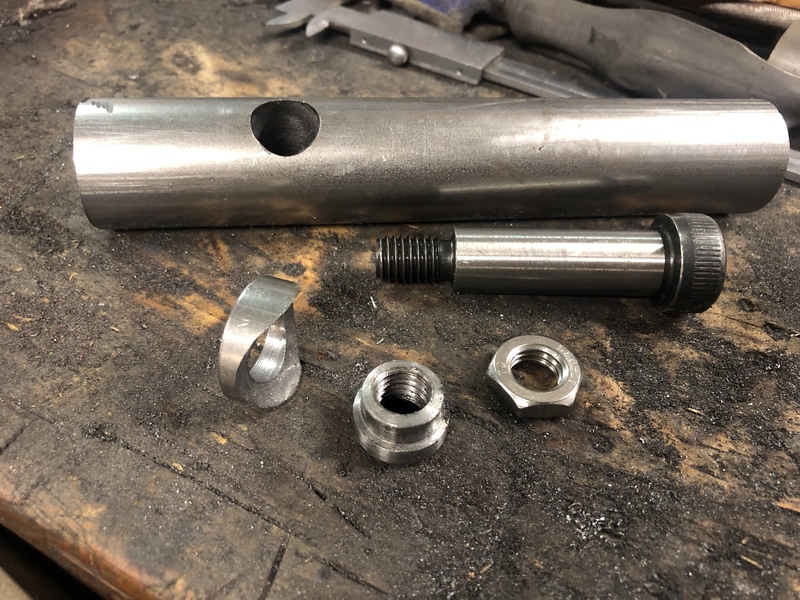 Square tube tacked on the end was to use as a holding handle, and a parallel to help drilling the rocker shaft holes afterwards. The result, after drilling and countrerboring for the shoulder bolts to sit in. I then tapped the ends to M12 - but there was a problem... this method relies on a perfectly square hole in both axis. 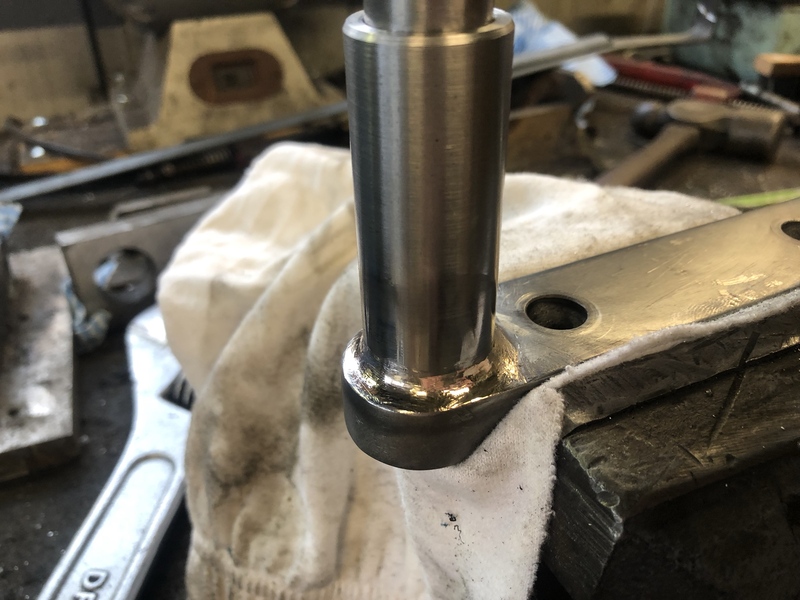 Off any amount and the rocker bushes won’t won’t sit flat against the leg. 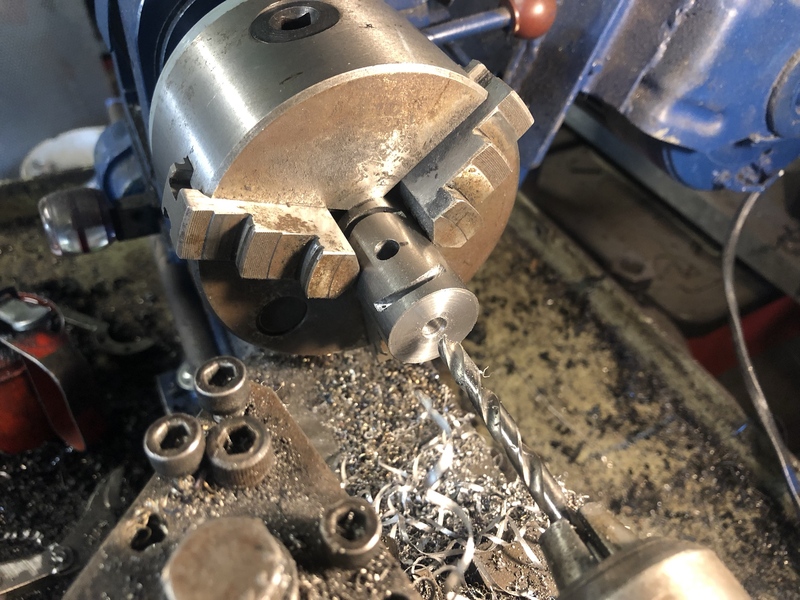 This is just something I couldn’t easily do in my drill press. 2 of these were passable but the others were very slightly off in one plane. I wanted to come up with something better, easier to fabricate, but still be super strong. In frame you will also see my steering stem that I machined on Prof’s lathe. Too long to do on my little lathe!!! 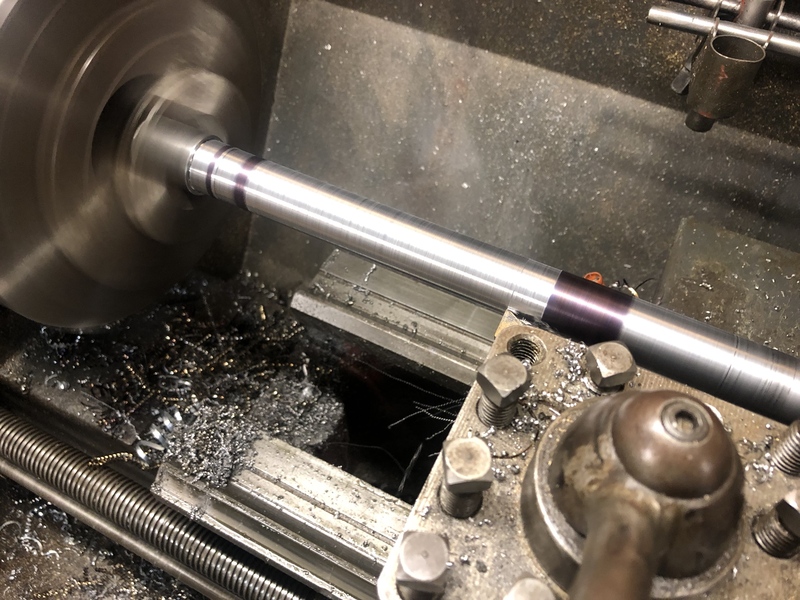 It’s started as 30mm 1020 bright shaft, some careful planning and turning for bearing surfaces, then a a 1” UNS thread for bearing preload and top nuts. It will be pressed into the lower tree and welded. V3, and final version of the Springer drop outs. I had been sketching out ideas and had a lightbulb moment sometime in the week. 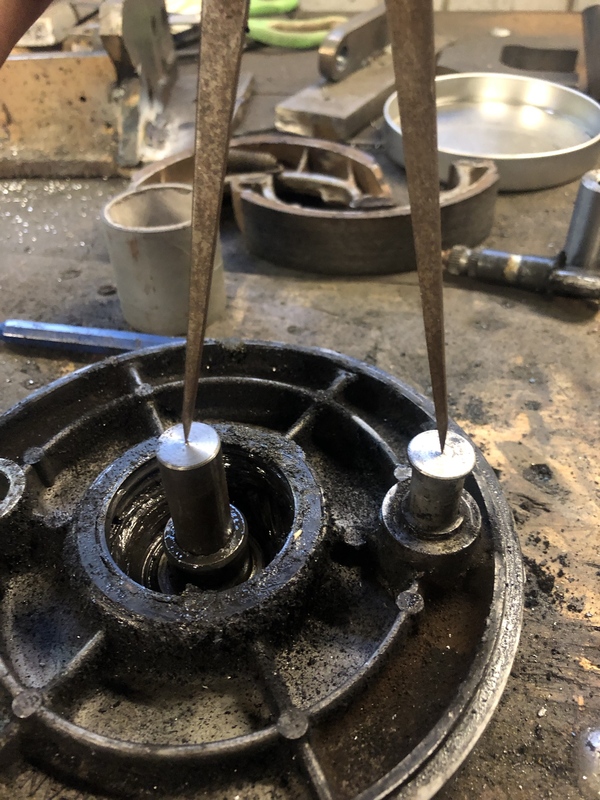 First need to make some “saddle washers” to suit my 1 1/4” fork legs, with a 1” diameter. Marking a centreline with a steelrule against the benchtop, use this point to centrepunch your guide hole. Follow the line down the centre of the diameter. By eye is good enough. Set up on V blocks and use a engineers square to level square the bar up against your line. 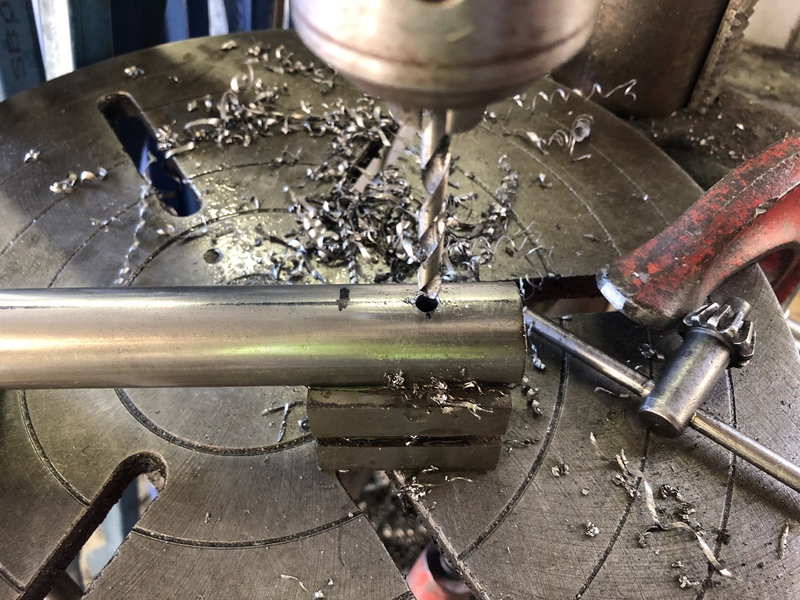 Continuing with a 1 1/4” holesaw, just going in this deep from both sides. 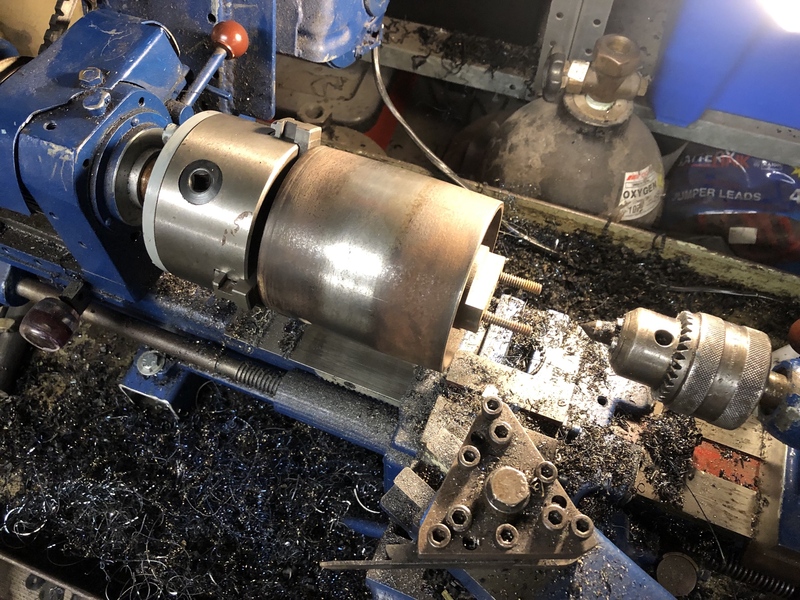 Moved to the lathe to face off, centre drill and bore out. 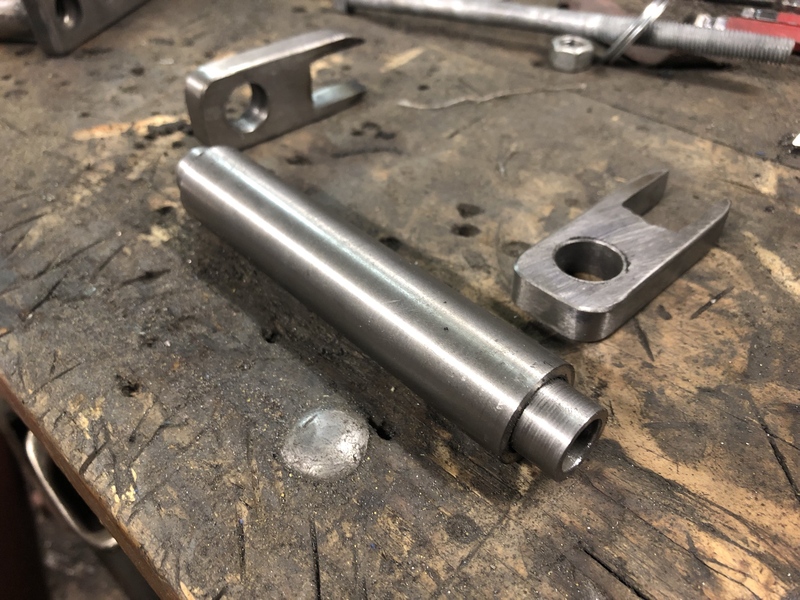 Both sides of this piece machined to sit 3.5mm proud of the fork leg. Now back in the drill press, with a vice this time and some wood to protect the turned faces. With this design I am using 50mm shoulder bolts. 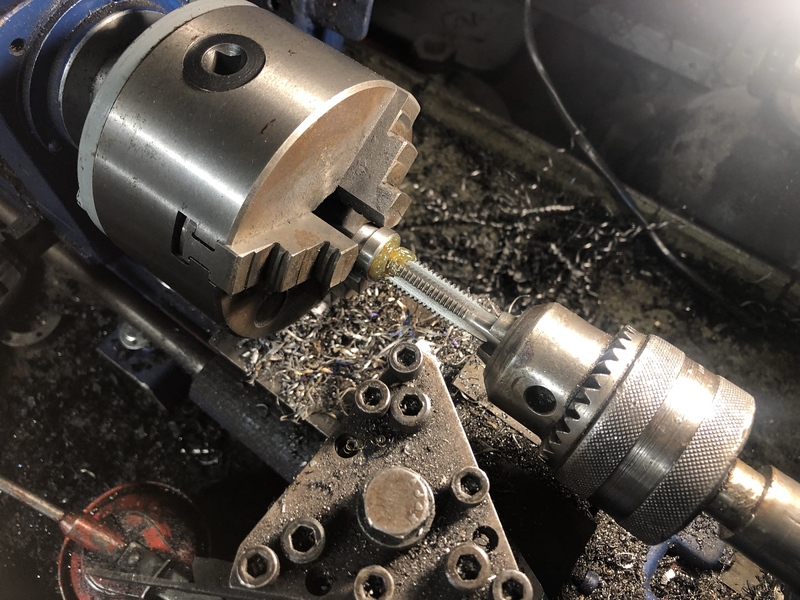 Allowing 20mm clear between the faces - 12mm Rocker, 6mm thrust bushings (3mm each side of rocker), 2mm for adjustment shims and another thrust washer against fork leg (to protect the machined face from wearing over time). 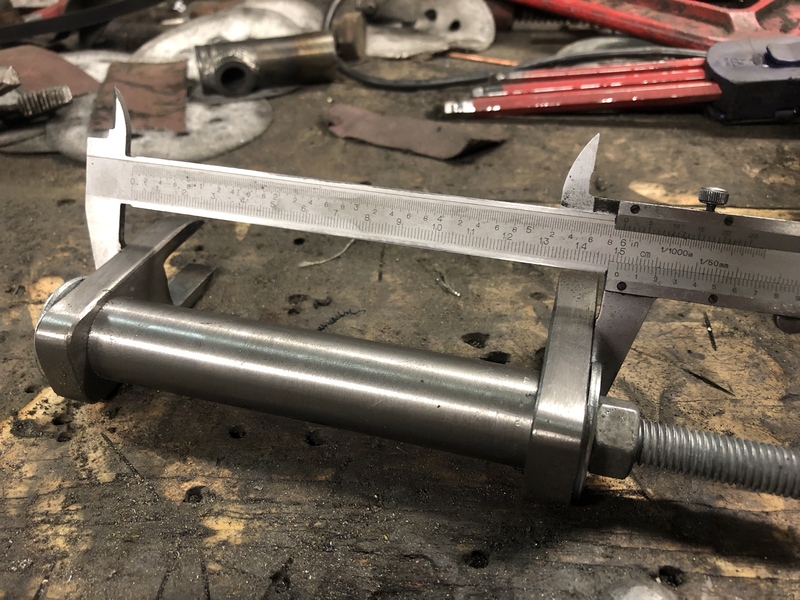 Measuring depth for the counter bore bung on the other side, to provide a hard shoulder for the bolt to tighten against. Using vernier depth gauge with black texta on it, then marked with a scriber. 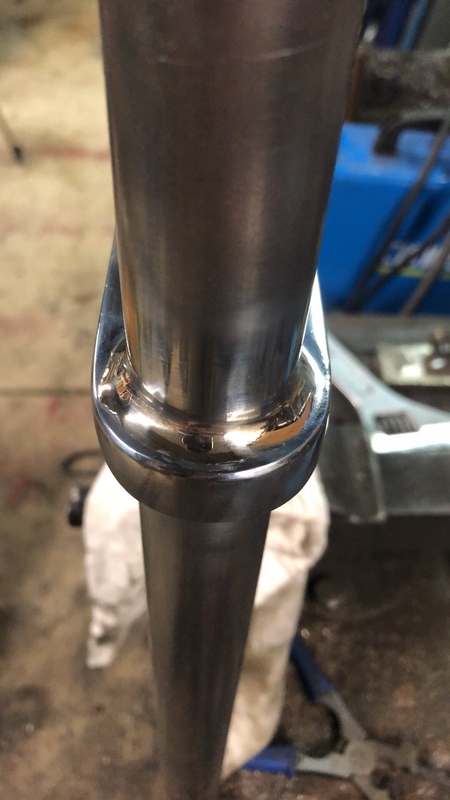 Stepped bung out of some 3/4 bar. 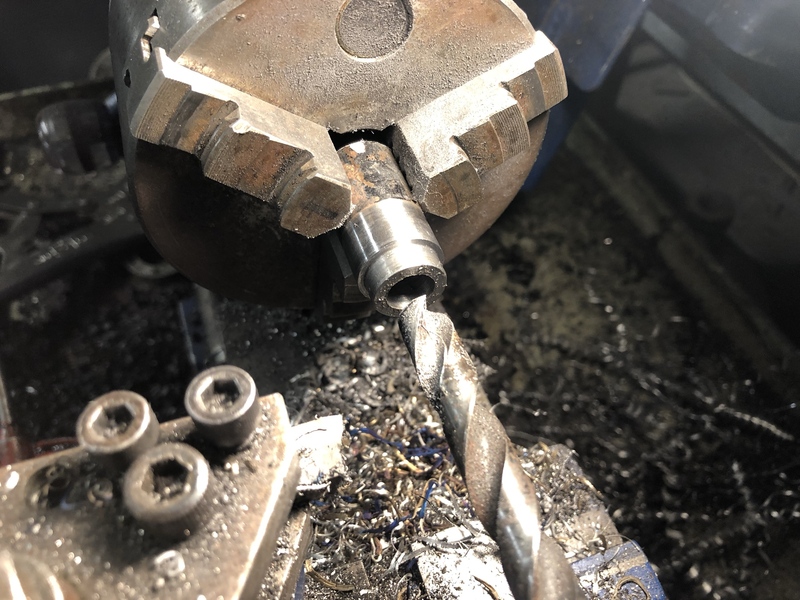 Drilled to 10mm ready for tapping a M12 thread. All parts that make up this design. Final score. 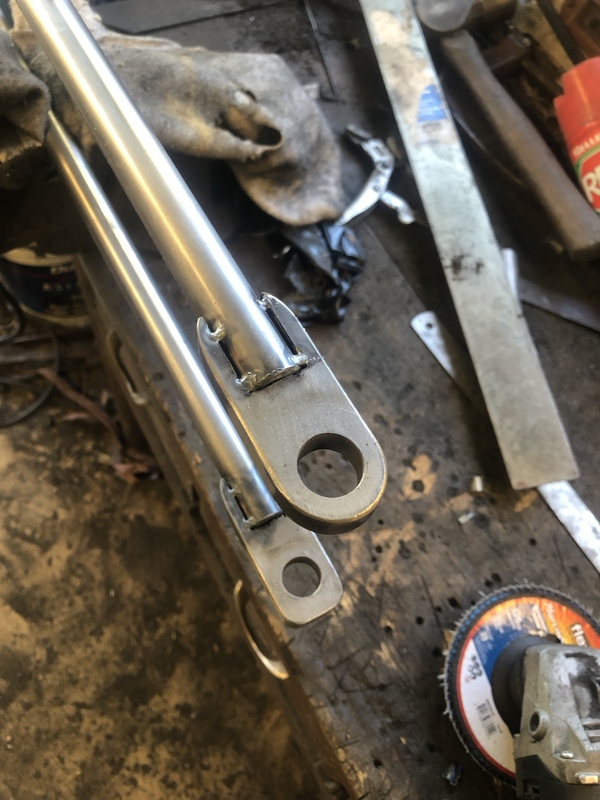 The tapped bung and the saddle washer will be welded to the leg end. 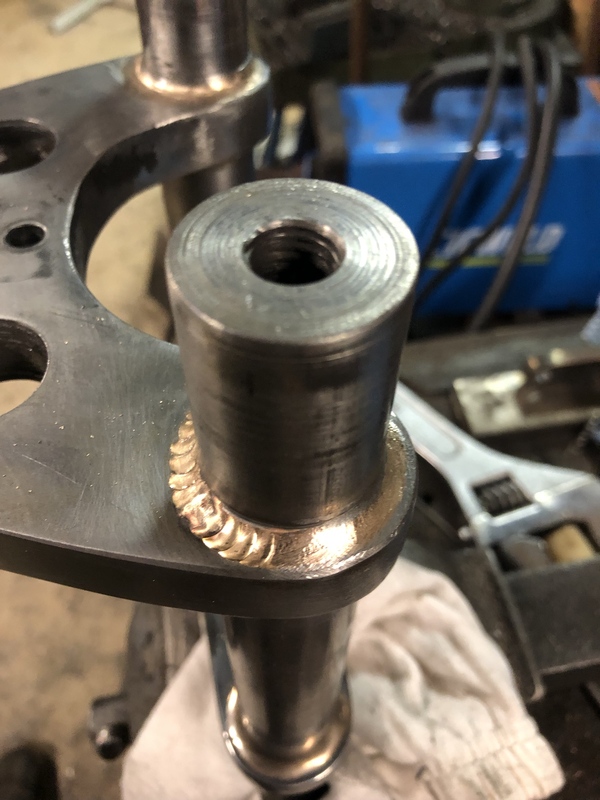 I will machine a spacer to fill the void and tighten down before welding to make sure everything is sitting just right. . The shoulder bolts pulls up tight against the bung and, then with a half nut on the end to lock it all down. Ain’t gonna go anywhere!! Finally against the fork leg. 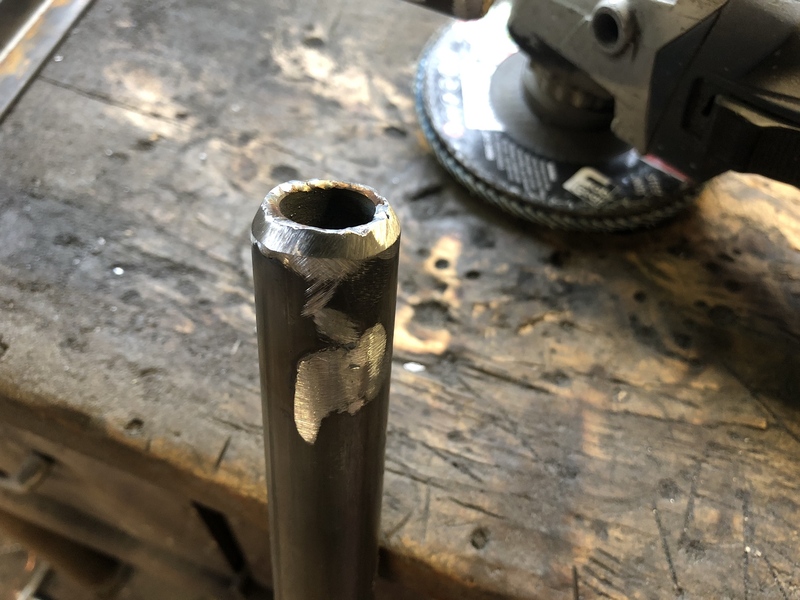 You can see the marks where the end will be turned down and pressed into the tube then welded and smoother back. Note that I can still remove a good bit of length from below the rocker pivot. I’m well chuffed with how this design has worked out. Just need to make another one. I have the front leg design planned too, and will hopefully cover that on the next post. Been a while since I’ve posted, didn’t do anything on the springer for a while but now have some progress to report. 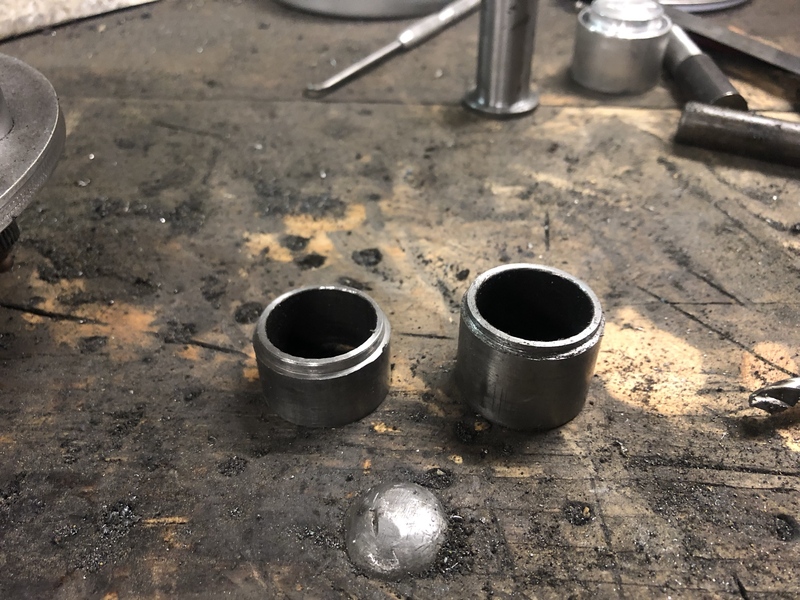 Changed the bottom ends of the main legs back to my original plan. It does look a lot cleaner and doesn’t make the rockers unnecessarily wide like the last design. 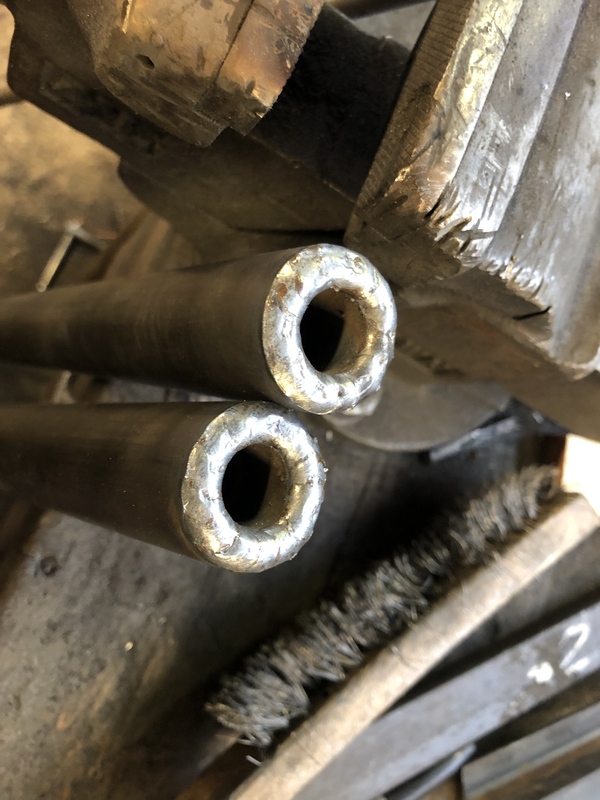 Made from bar stock and turned down to press into the legs, which are also drilled for rosette welds. 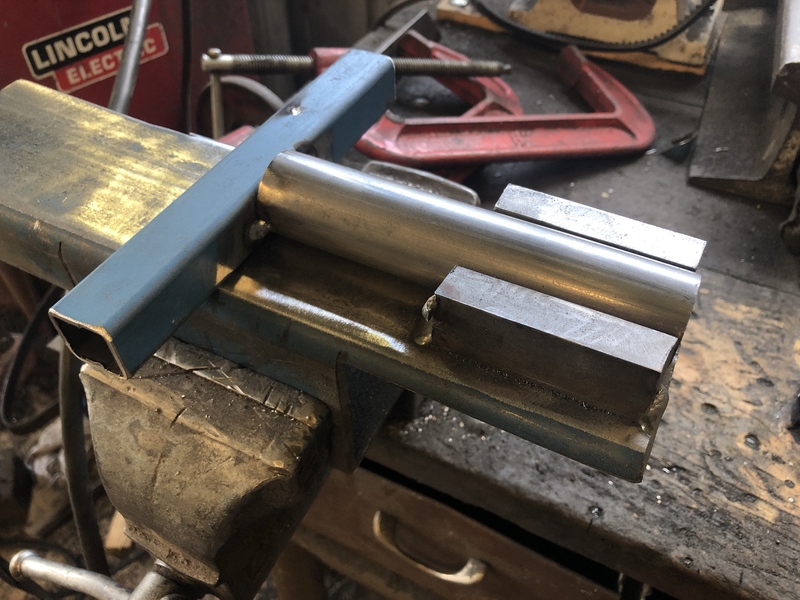 I also made a skinnier spring bridge as the first design looked too bulky. In actual fact this one might be too spindly, so I will go to V3 with i get the right material, but will do for mock ups now. 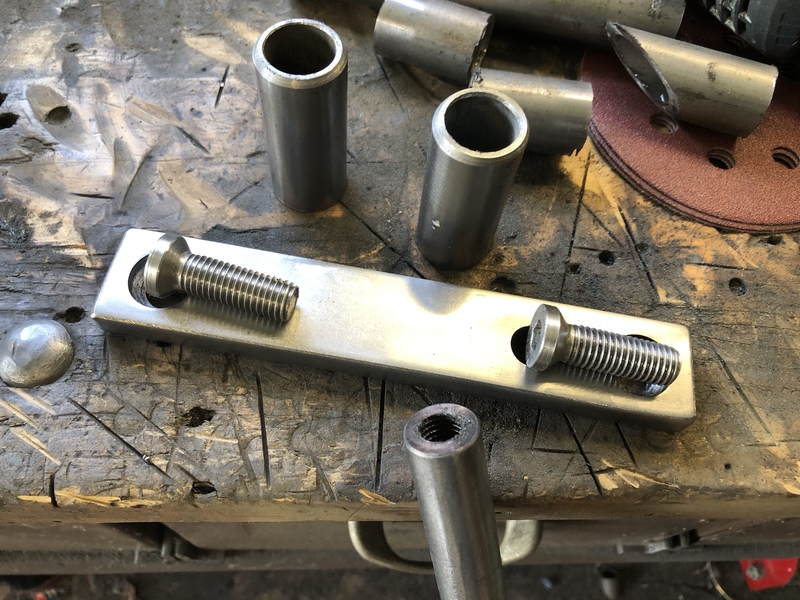 Also shown are the rocker terminations for the front legs from 12mm plate. 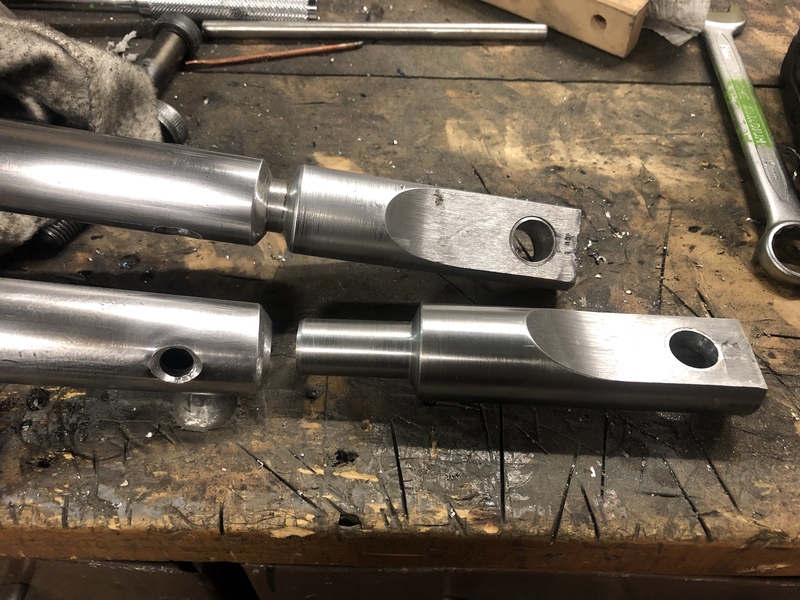 Front legs are 3/4” x .120” DOM. 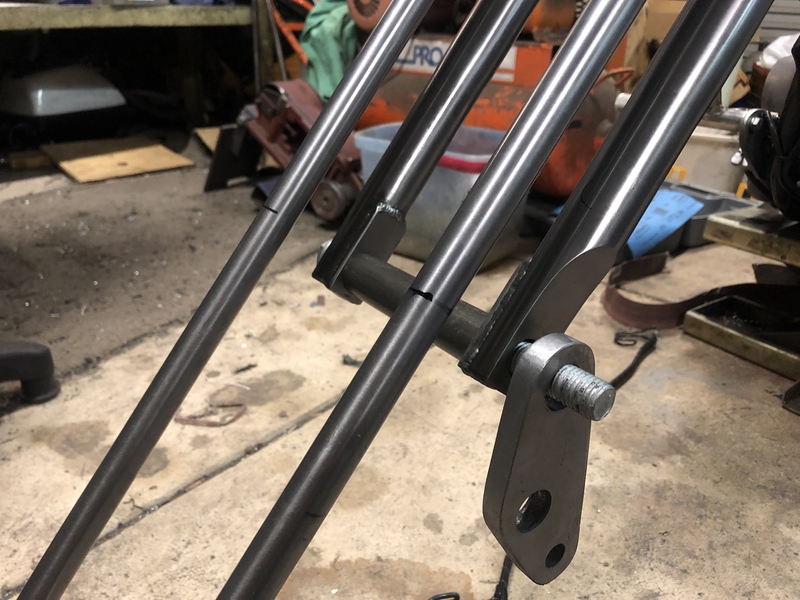 Threaded slugs pressed in and welded onto the top ends of the front legs. 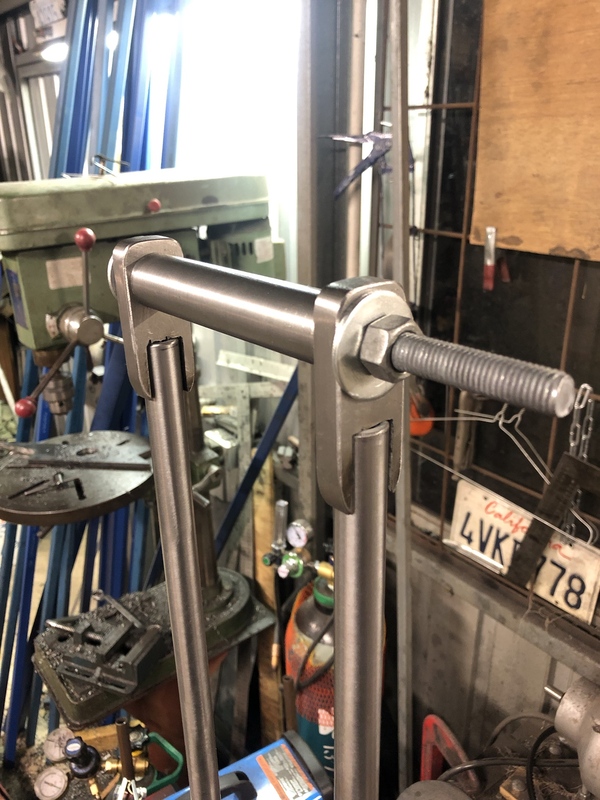 I am using a bolt together front leg design so that I can fine tune the length and rocker angle if required by adding spacers. I have picked up a TIG welding setup and have been practicing a lot, it’s a steep learning curve but good fun. 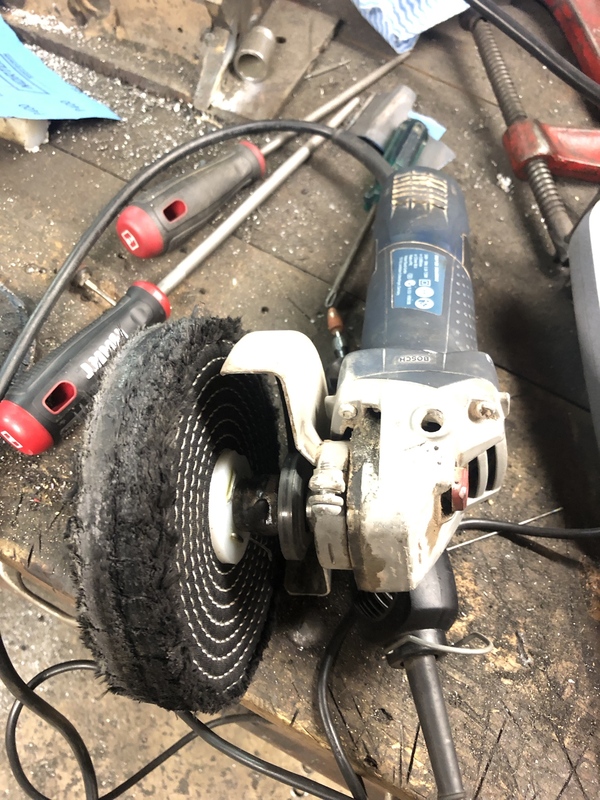 This has just been given a quick once over with a finishing disc on the angle grinder. Spring bridge countersunk and some bolts modified on the lathe to sit flush with the top. 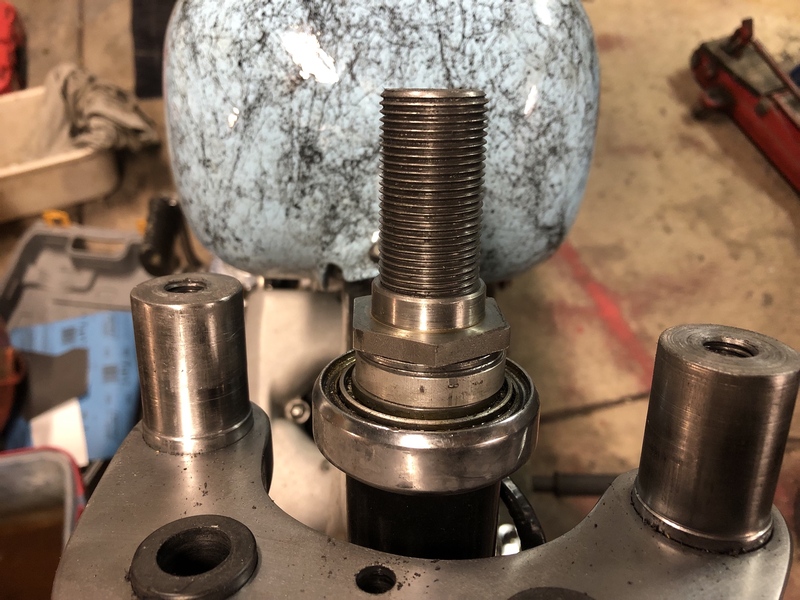 The springs actually sit over the bolt heads party so it needs to be flush. Some pieces of 1” DOM cut and cleaned up to finish my top tree design. This is still a mock up part though and will be remade before finishing. Got busy and missed a few photos, but basically to a point where I needed to fit up the front end to make sure everything fit. Pull off the glide and pleased to report that all is good. 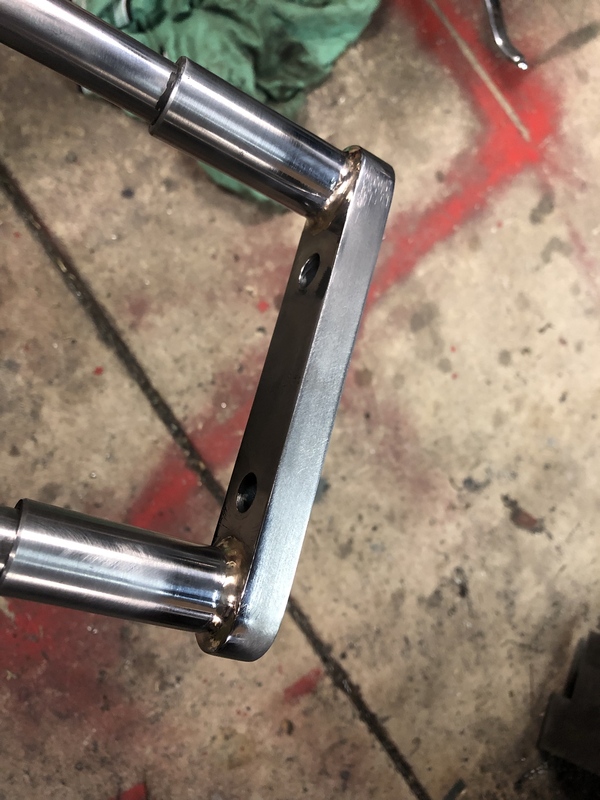 Main legs back to the workbench, aligned flat and tacked together with the TIG. No going back now! Front legs assembled, again with a test spring bridge. I will make another one with the same dimensions but a little thicker, 16mm to match the trees. 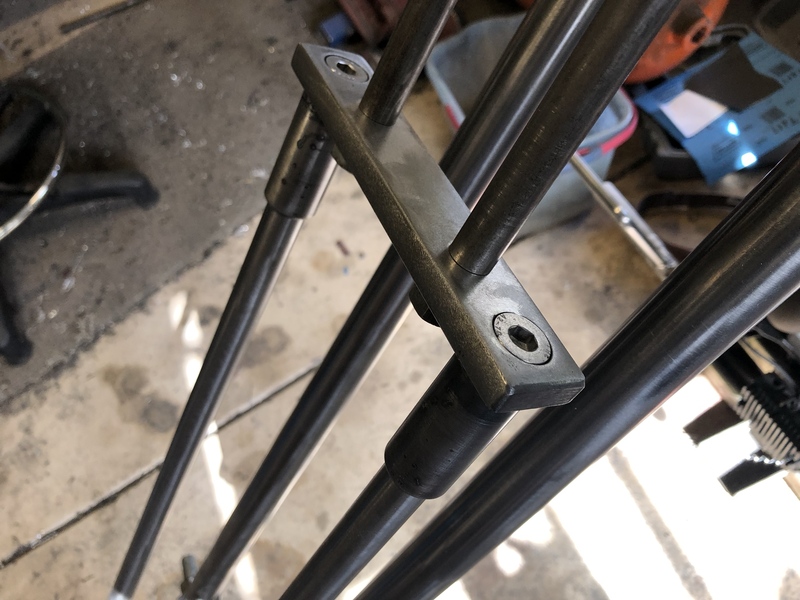 1” tube sections welded to underside, the front legs pass through and pull up tight with the countersunk bolt. 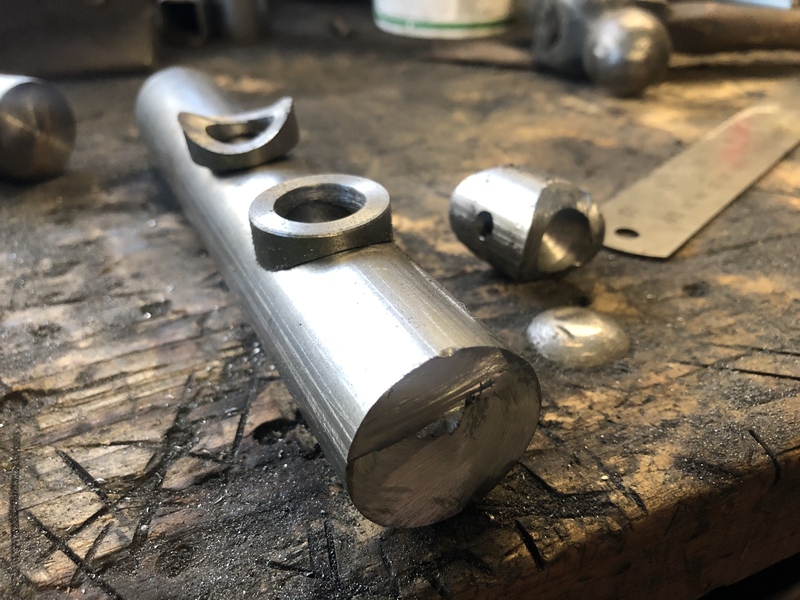 Making steering stem hardware on the lathe with some plain steel half nuts. 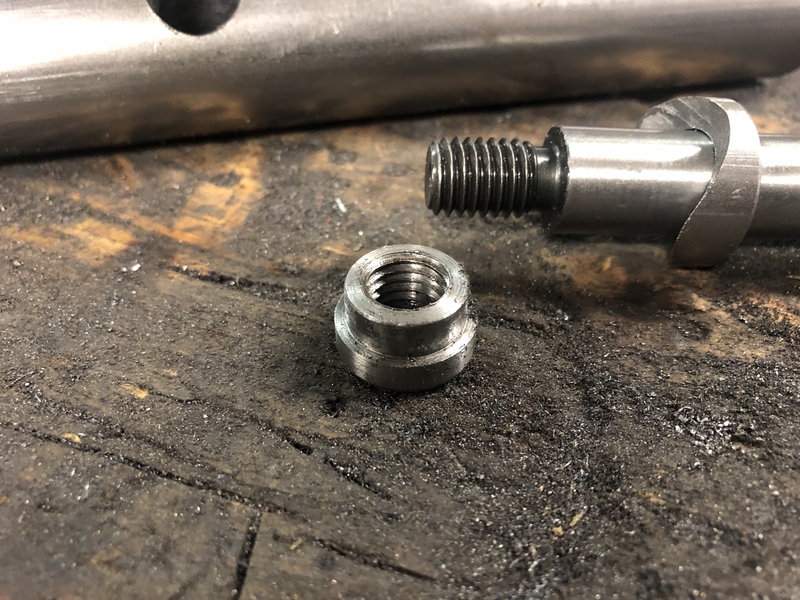 Use one as a packer to keep the outer nut square, and turn down to suit the bore in the top tree. 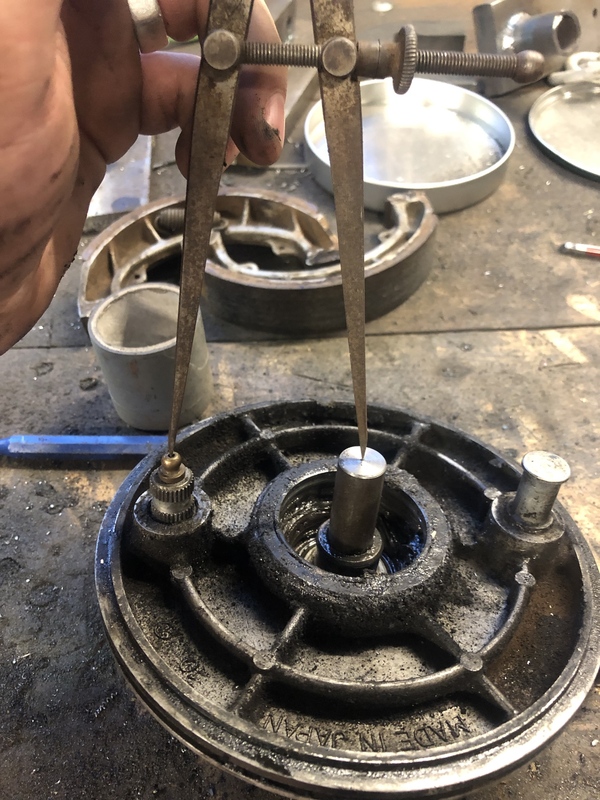 This aligns everything properly and keeps the threads protected. Here’s a shot overall with springs and front legs fitted up. Obviously the front legs need to be cut to length and finished, this is the next stage. 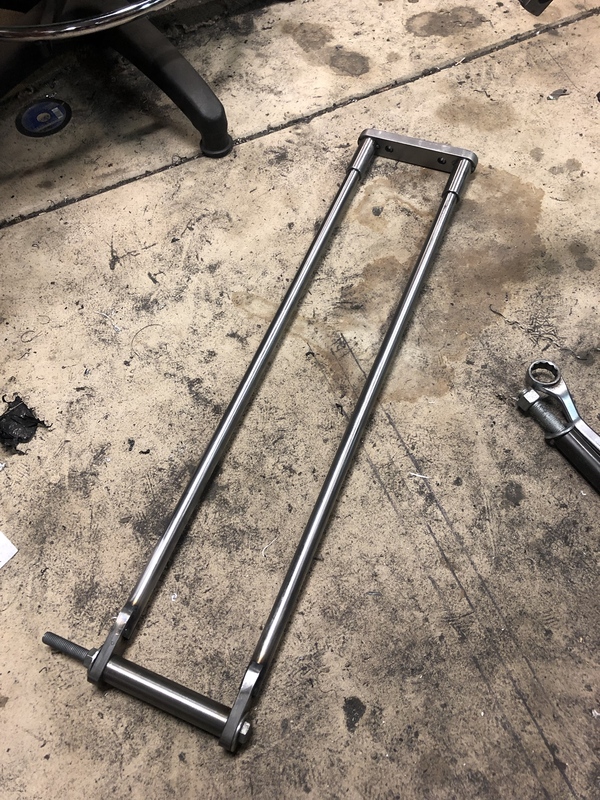 Pretty stoked with how this is all looking, and my steering stem has worked out great, but just needs another 1/2” of threads cut, no biggie as the stem is removable. Just want to add that everything here is mild steel, but has been pre sanded / polished before assembly. It makes a huge difference and will save a decent amount off the chrome bill. Close up shot of the lower end of the main legs. 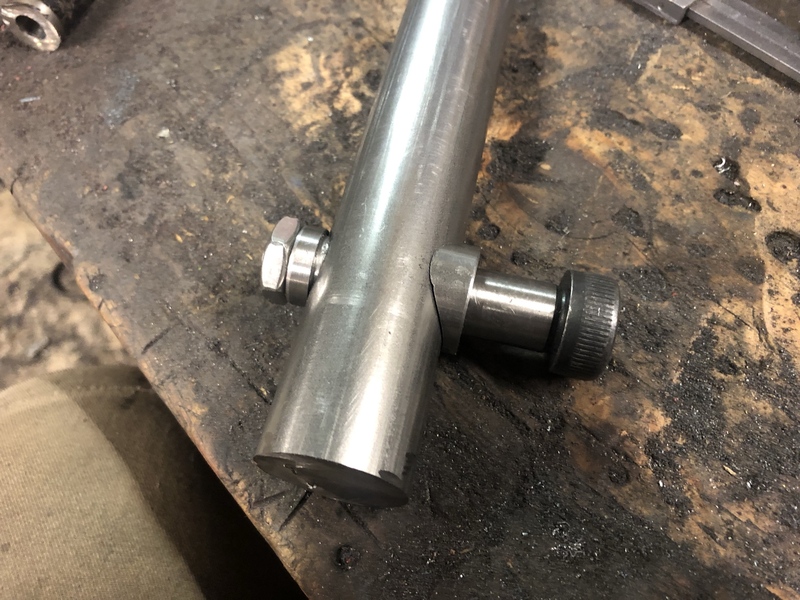 I notched out the backside and welded in some flat bar to give the head of the shoulder bolt something flat to pull up against. 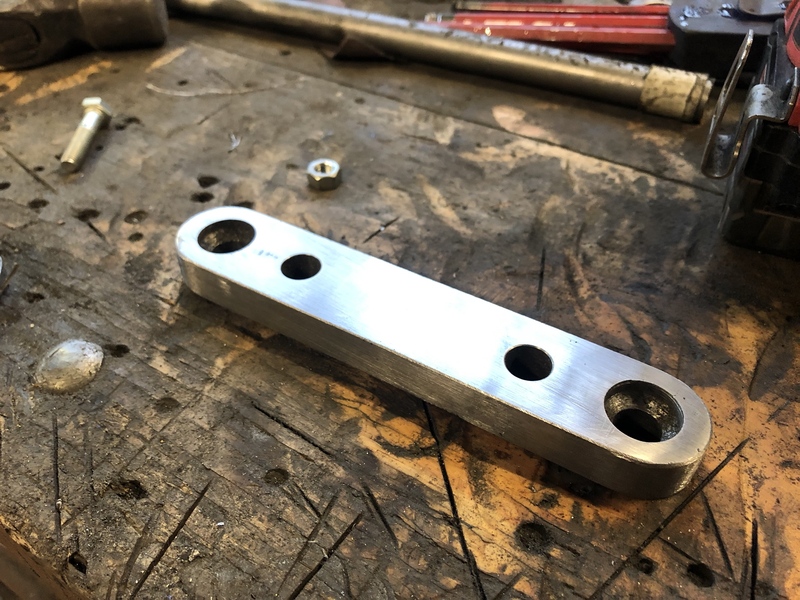 I had used a machined piece of bar through both pieces to ensure straight alignment. I am using 16mm shoulder bolts here, but have drilled these holes out to 18mm. 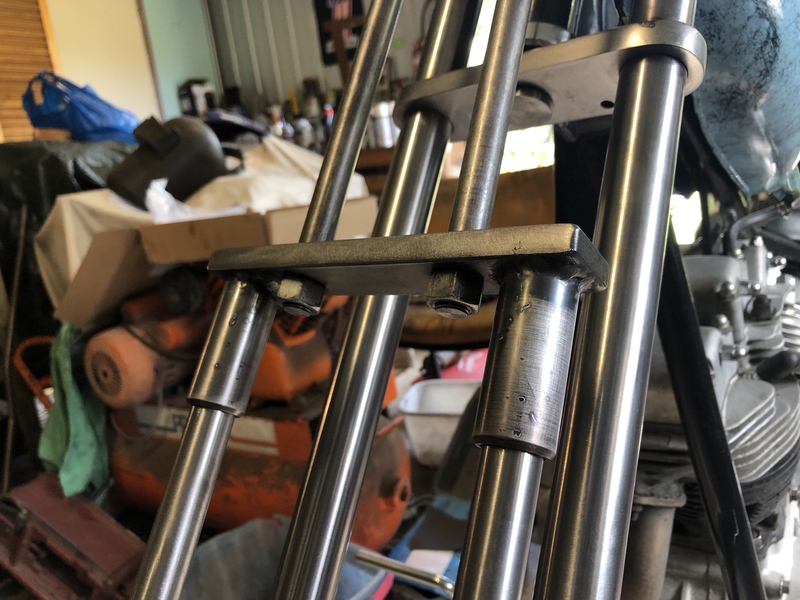 As the shoulder bolts need to press in firmly, I will machine some bronze sleeves that press into the fork legs with the right OD after the forks have been chromed, and with the suitable ID for the bolts to press into. Also allows the sleeves to be replaced if anything wears out over time. Makes sense in my mind anyway. A test sleeve is actually visible in the first picture of this post, made from aluminium. 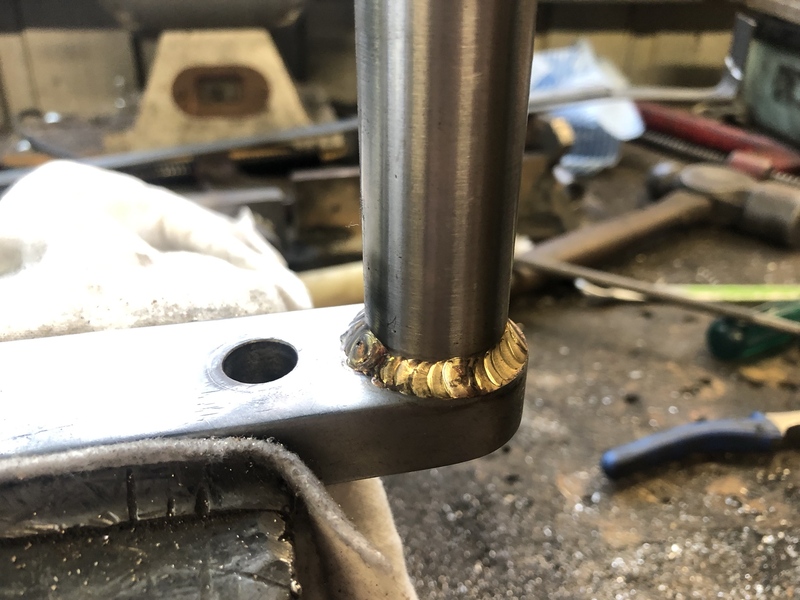 To make sure the legs were square before tack welding, I faced off a length of 1” DOM to 110mm and tightened a bolt between the legs, this will stay in for the welding. Will need do similar for the front legs too. 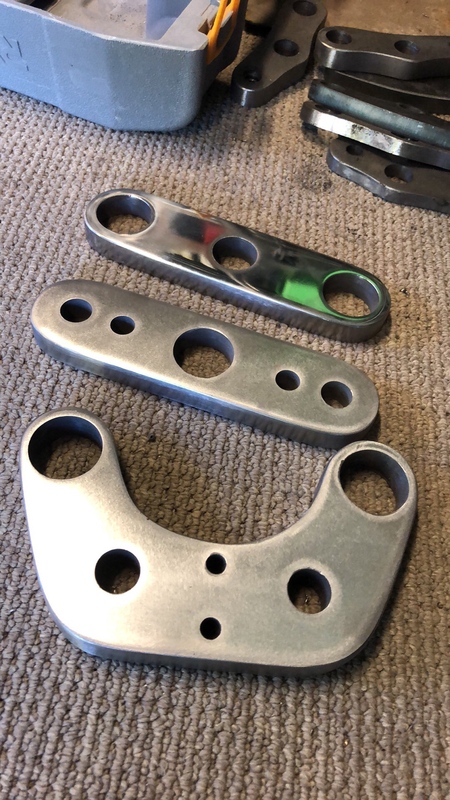 Just quickly whilst it’s still in my brain, the chromer said there’s no need to fully polish parts, as it will be triple plate chrome (copper > nickel > chrome plate). A smooth finish (e.g. 400 grit) with no visible scratches will come up fine. Having said that, I’m really getting to the end of my tether with this damn springer so I’m keen to get it done and plated. I could have spent a lot more time sanding and polishing parts but it’ll be interesting to see how it all comes out. Thanks El Skitzo!!! Glad some people are enjoying it. Does take a fair bit of extra time to take all the photos and write up the posts. And what’s this? Another one! 2 posts in 3 days!! Just some quick bit of shed therapy after work today. 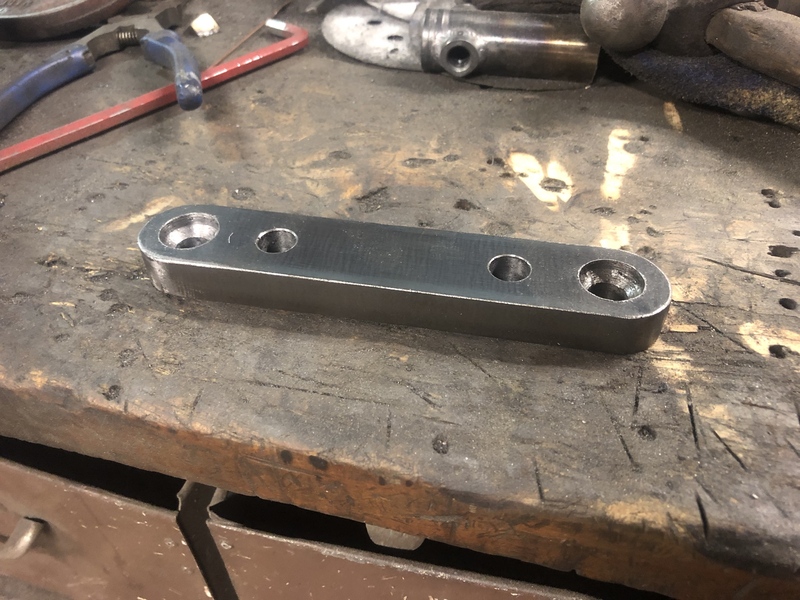 Here’s a little bung I made for the brake arm. 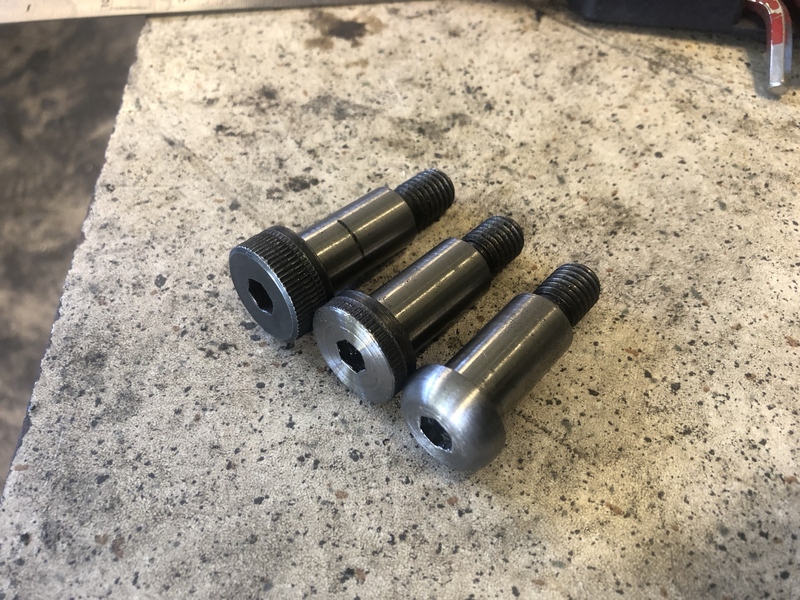 I will likely use a 10mm Heim joint and a button head bolt. 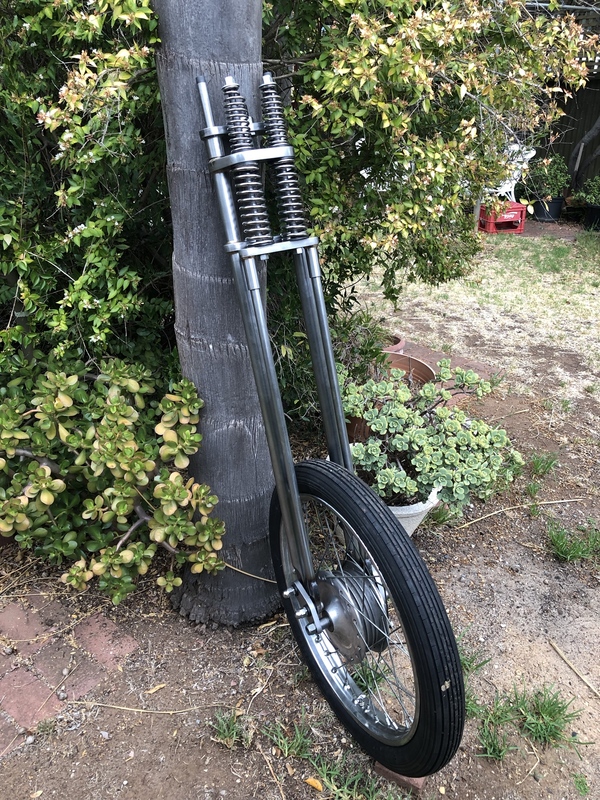 Had a awful realisation that this might not work with my hub, because the forks are sooo narrow, but I keep forgetting the axle location is actually about 3” forward of the rear legs, alas heaps of room. Good reminder to never throw out anything substantial! 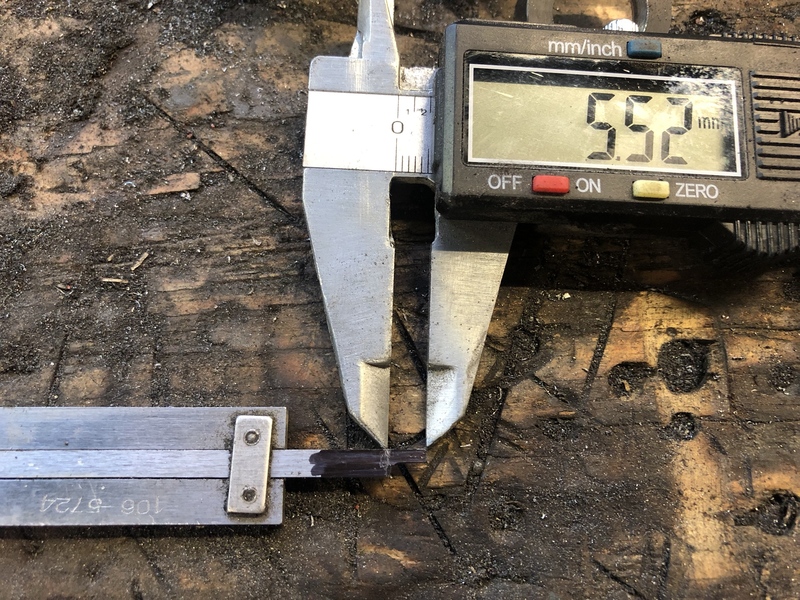 I found the perfect piece of material for the final spring bridge, in 16mm to match the trees, and an added bonus of having one end rounded already! 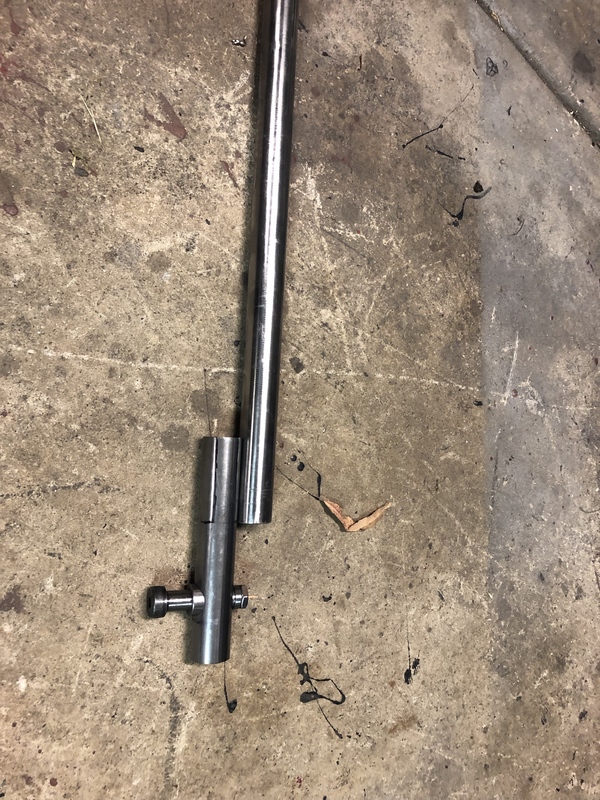 This was a blank steering arm I had laser cut when building my hotrod, but in the end just used a stock part and kept this for a rainy day ( yes it was actually raining this evening!). Snapped a piccie of my stem hardware, as underneath the top tree. Can clearly see the stepped preload nut that locates into the top tree. Under this are a few spacers for the time being. 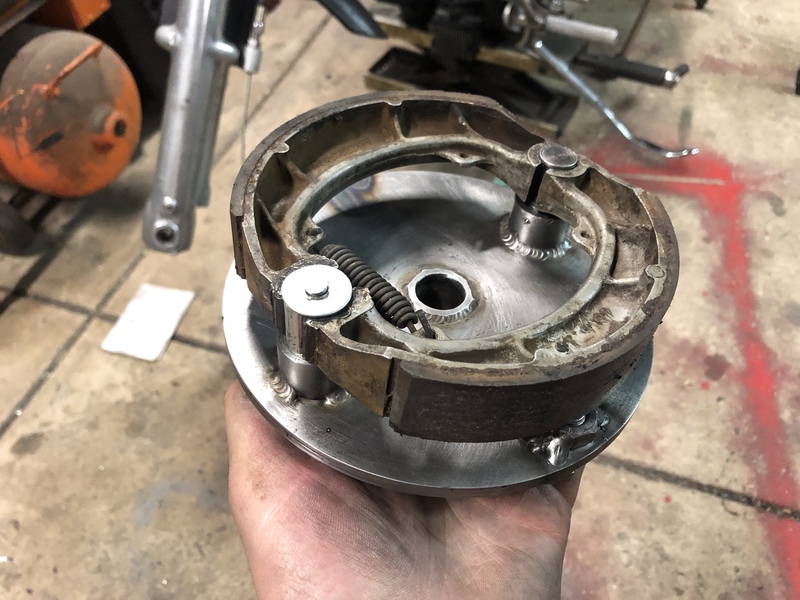 I need to fabricate a spacer of similar height with a built in dust shield. I have preload adjustment all sorted in my head, but can’t really portray it easily here. I’ll have to make a little video at some point I think. Anyway, the same type of nut is used on the top side of the tree also. Next is a little tricky thing that took me a while to crack. 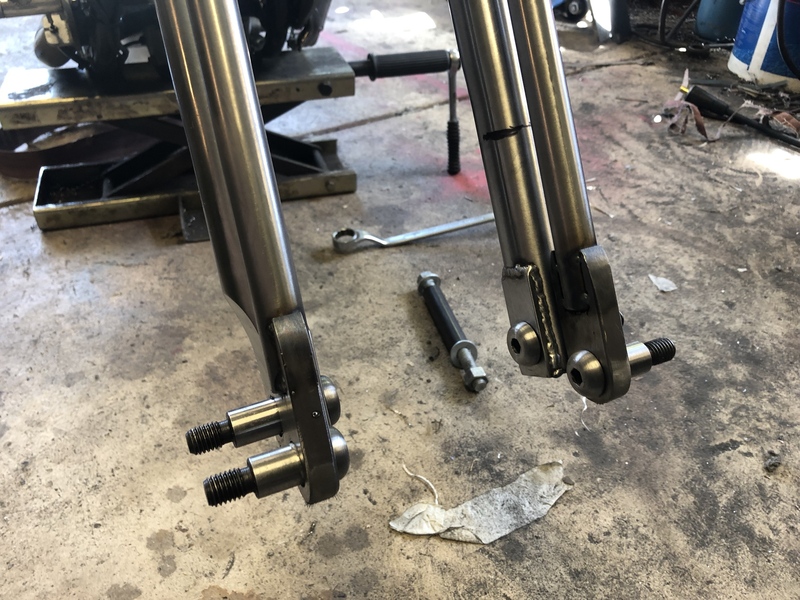 I have to position the front leg dropouts so they make up the same width as the rear legs, when measured at the outer face. Here measuring the outerface width of the main legs. 150 something is about right.. 150.3??!! Guess that’s what it is! 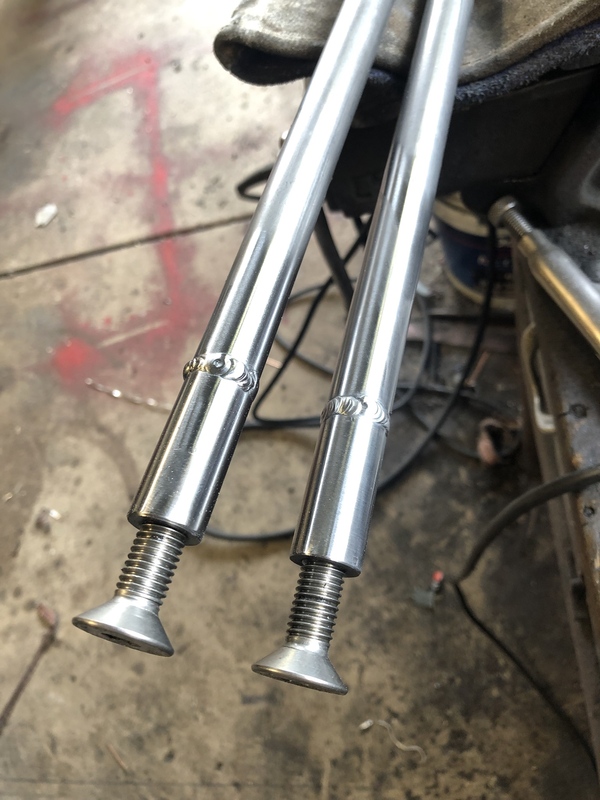 Now I need to make sure my front leg dropouts come in at the same width. 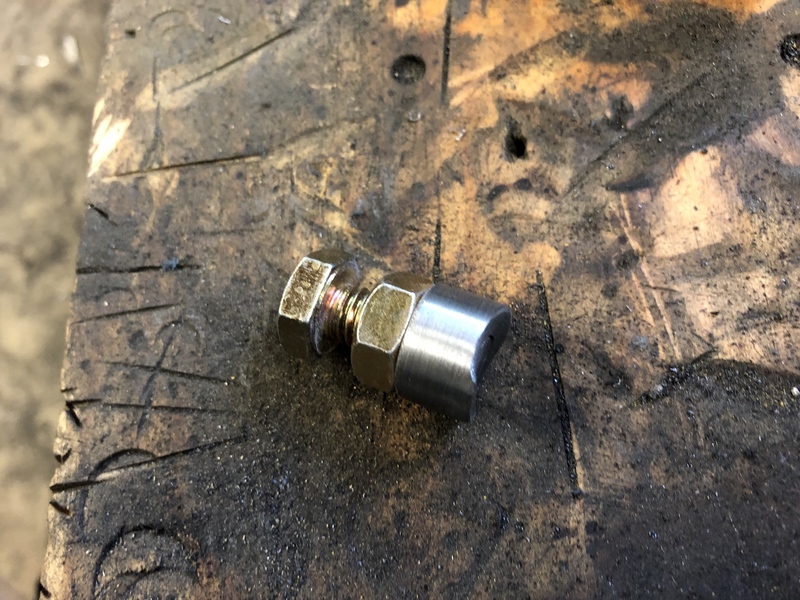 Now I know the dropouts are made from 12mm plate, but that’s only a guide. 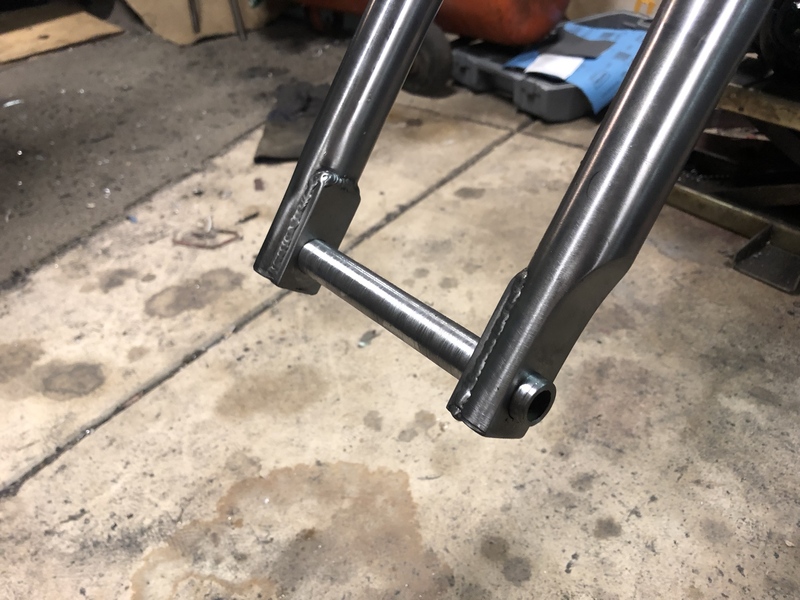 By setting the verniers do the desired width, I stacked the two dropouts next to each other, then carefully faced a length of 1” DOM until it fit perfectly along side. 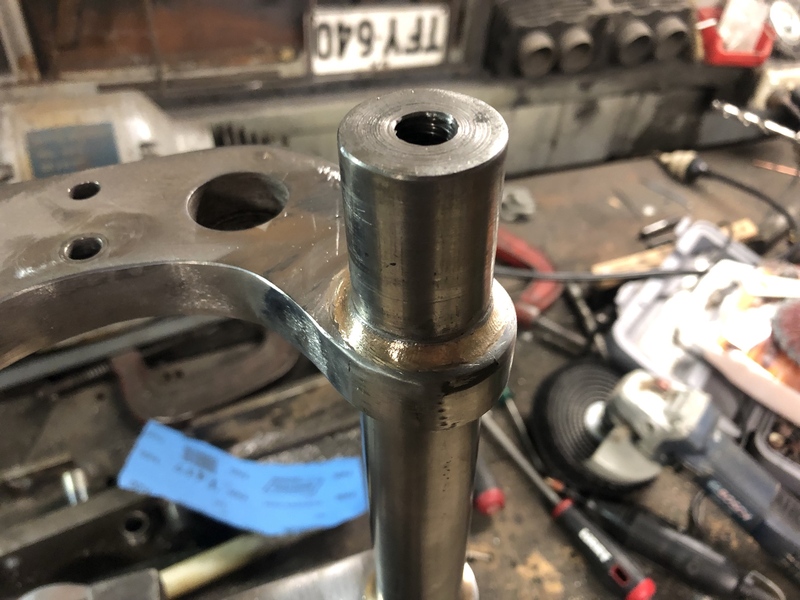 So now by bolting the dropouts together, with this tube spacer in between, will give me the exact width required. Front legs marked for shortening. 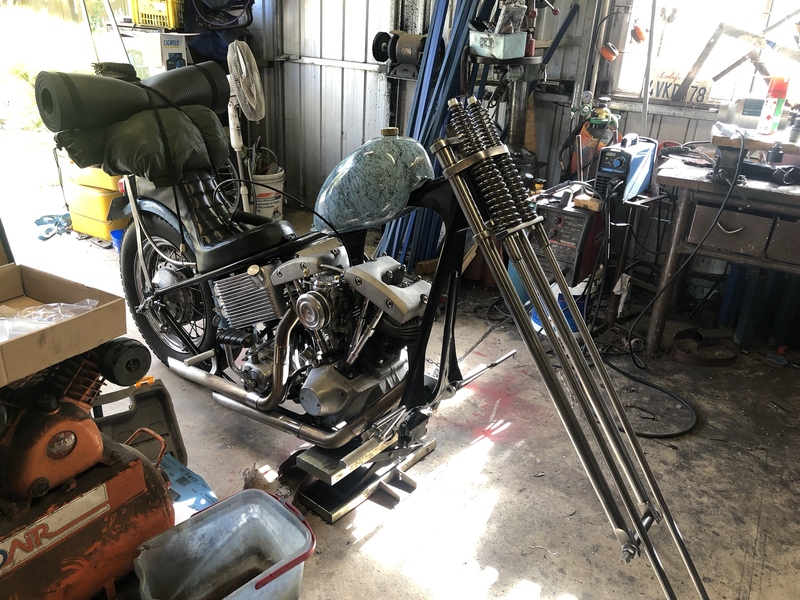 You can see the rocker hanging loosely, these rockers are copies of stock Harley UL rockers, except made from 12mm plate. 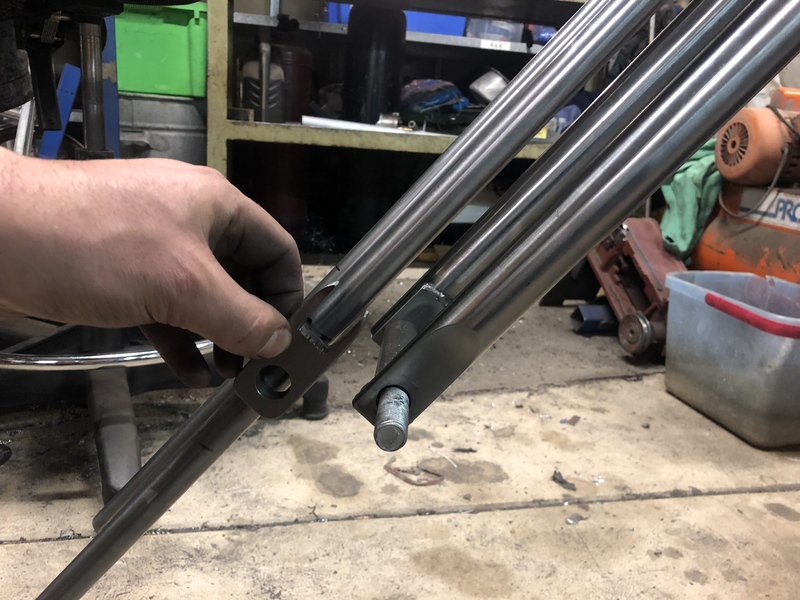 Research tells me I can expect about 1” compression of the springs under the bikes weight, so I decided upon a length that will put the front axle 1” below the rear rocker bolts without load. 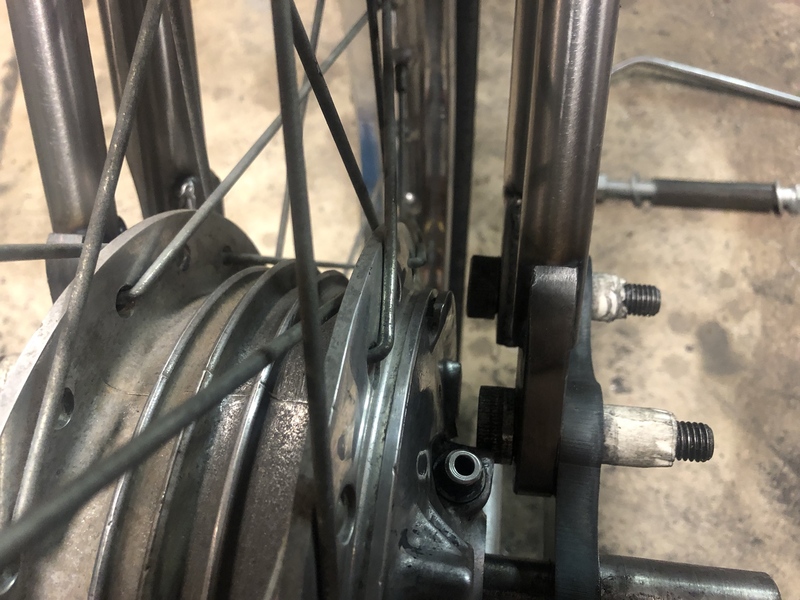 Under its own weight, front axle should be more or less level with the rear rocker bolt. Will it all work out? Who knows, there can be serious science with rockers and springer design, but I am taking the simple approach! Itll all be decided out on the road! 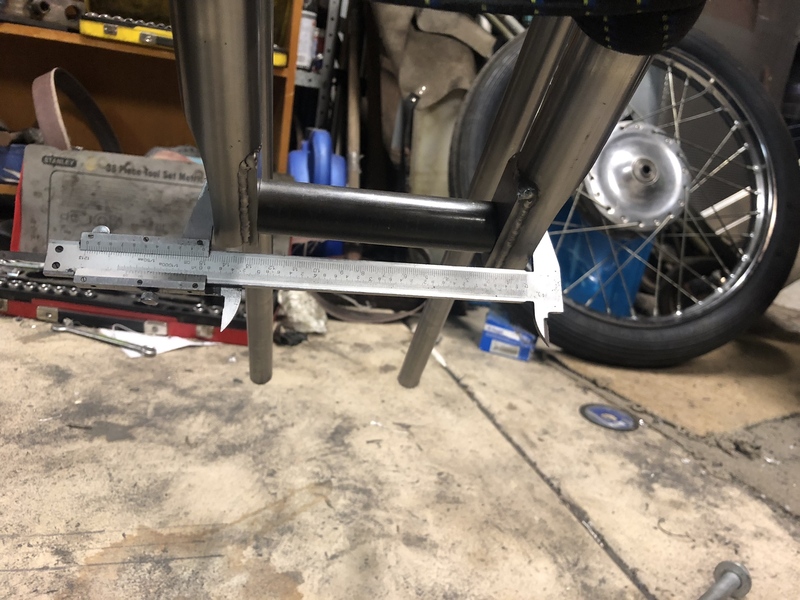 Mock up of where the front leg dropouts will sit. Shot of the spring bridge with countersunk bolts, pretty happy with how it turned out. Delrin spring seats just visible. 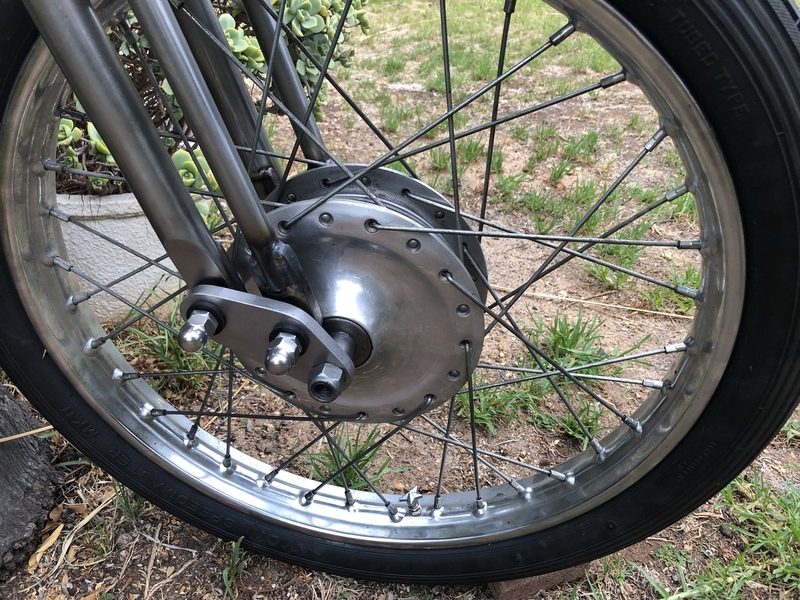 Have been thinking of adding a steel disc under the spring as the Delrin overhangs the width of the spring bridge. Lastly.... can’t have a post without some sort of hassle.... 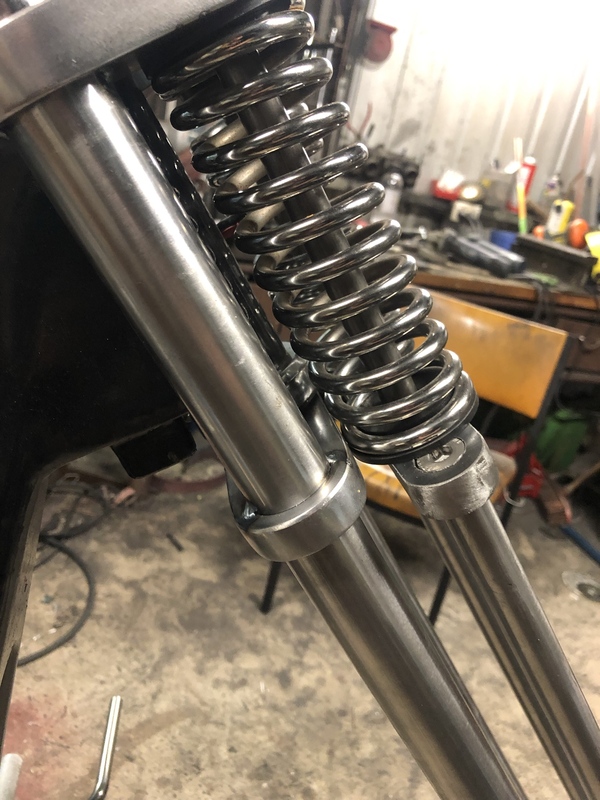 I forgot about my spring clearance before welding the fork together!! I was supposed to notch out some clearance on the bottom tree to clear the springs. Still something I have to do but will just have to do it assembled with a flap disc and then sand smooth. Bugga!! 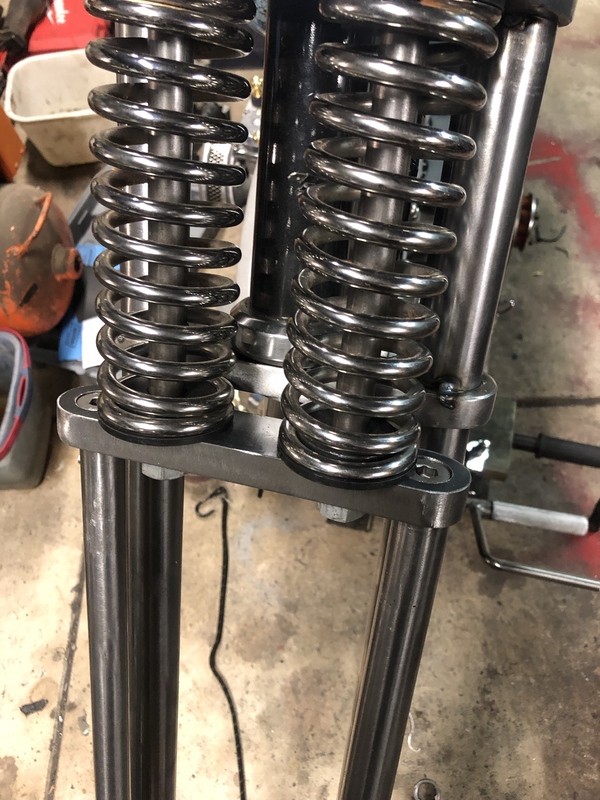 It’s really only an issue at full droop, under compression the springs will clear the tree and all will be fine. Good to see the process laid out and appreciate the time you've spent putting this all up. Final spring bridge shaped, mill scale remove and sanded smooth. 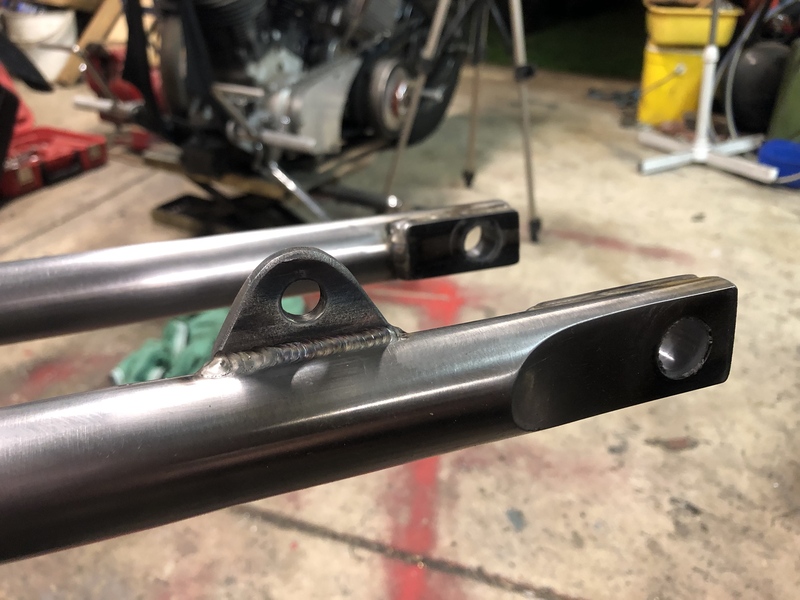 Using the front leg spacer I previously described, I added some stepped ends to locate the dropouts. Using a long bolt thru the centre pulls everything square, and of course the width came out spot on. 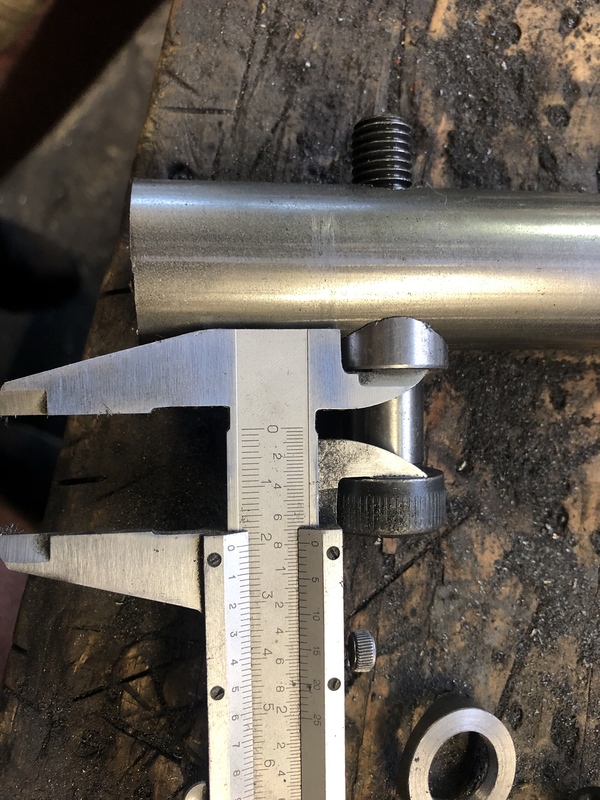 Whilst I was at it, I machined a some tube down and slipped it though the main drop outs, just to be sure alignment was all OK there. Front leg assembled for tacking. 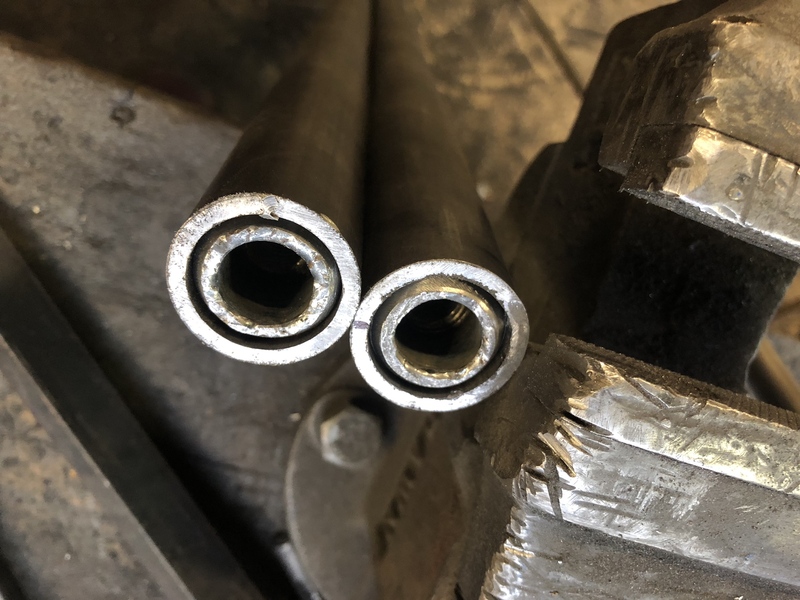 Used a length of welding rod ground to length to keep the overall length identical on each side, measured from underside of spring bridge to spacer tube. First dry assembly.. uh oh we’re going to have clearance problems!! Not to worry, this is just the beginning. Firstly I rounded the front leg dropouts. This wasn’t an major issue, but rounding them off does free up more space around the hub. Main issue was with the shoulder bolts. I took some off the head thickness and then domed the heads. Enough room now to bolt the wheel in and everything clears on the right side, but still very close on the left. Pressed into the legs with some temporary sleeves made from nylon. 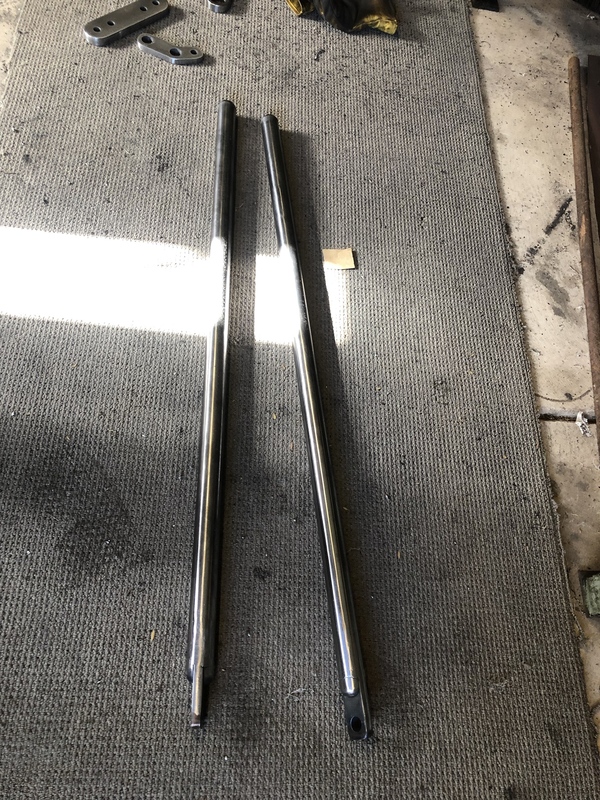 I have about 20mm of shaft clear for rockers and bushes. 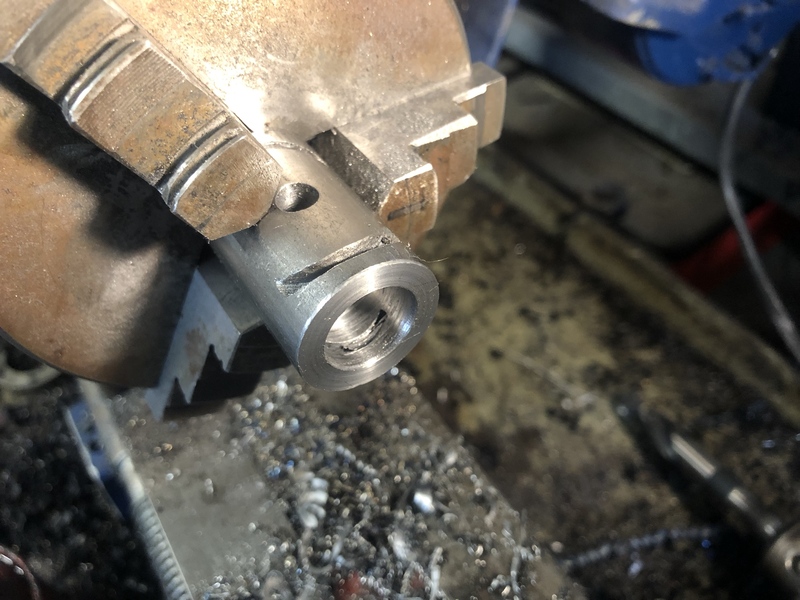 My lathe decided to start tripping the circuit breaker, so some rewiring is in order there, but frustratingly meant I couldn’t machine my rocker bushes. I’m using Delrin for these and had it all ready to go, but will have to wait for another day. So here it is all assembled with some washer spacers, no bushes and a loose bolt for the front axle, but, it’s on it’s own weight for the first timer!!!! All looking good so far. Rocker angle and spring to lower tree clearance is fine. 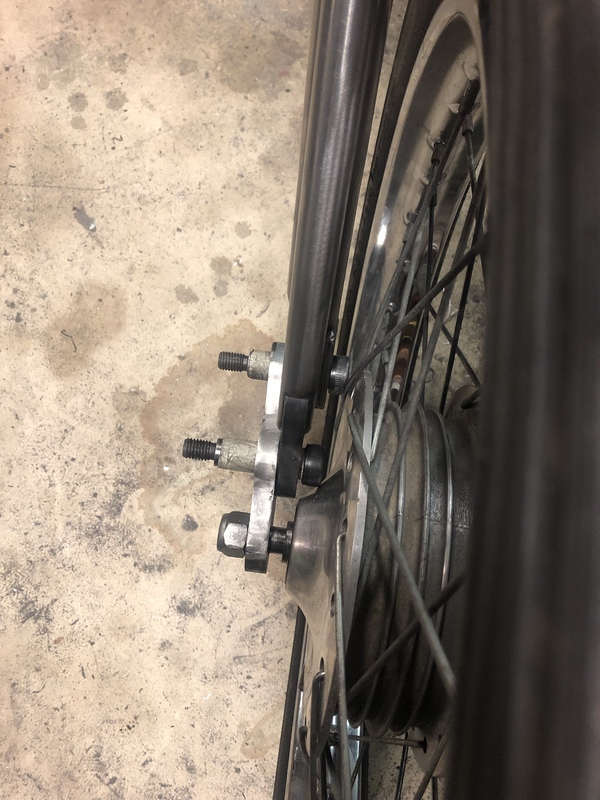 Because there’s no rocker bushings and the axle is loose, everything’s all a bit sagging here and the clearances will actually grow a bit when everything is located properly. Now back up to the top end. 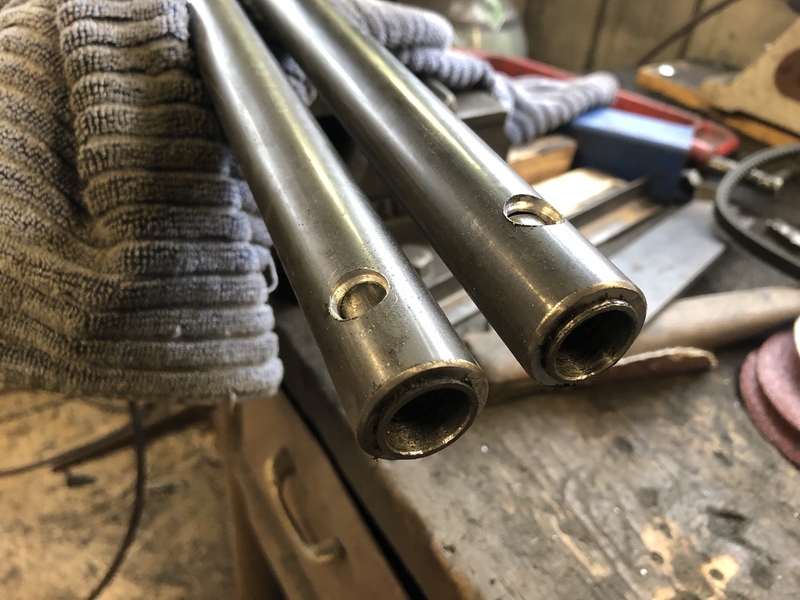 I faced some lengths of 3/4x.120” DOM for handlebar risers. 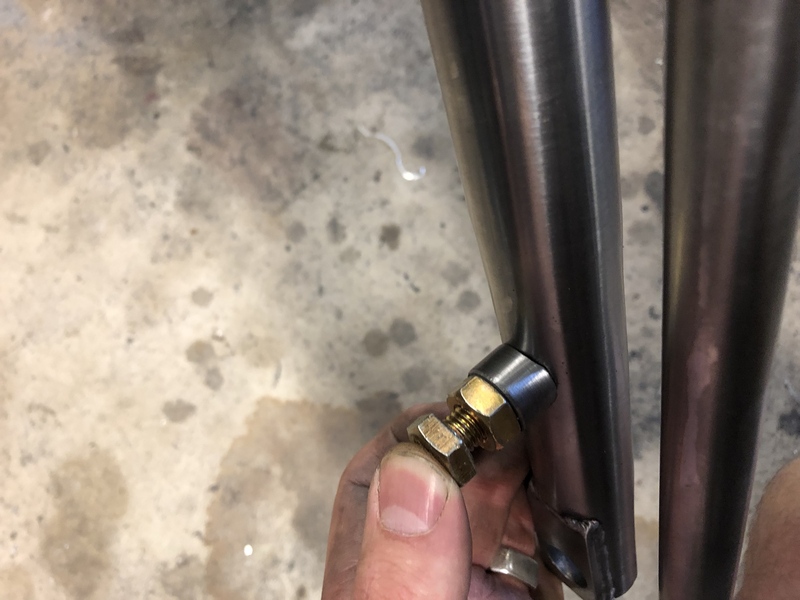 This size tube has the double advantage of being a perfect slip fit into 1”x.120” tube (for the handlebars) and accepts a 12mm bolt nicely through it. 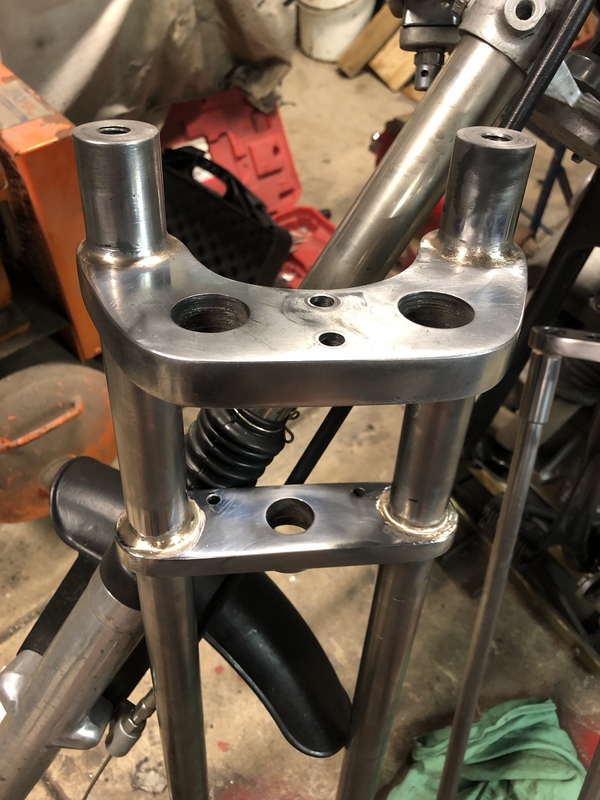 Some 120mm socket head cap screws pull everything together, and this is what actually secures the top tree to the main legs, along wIth the sleeves welded to the top tree that also slip over the legs. 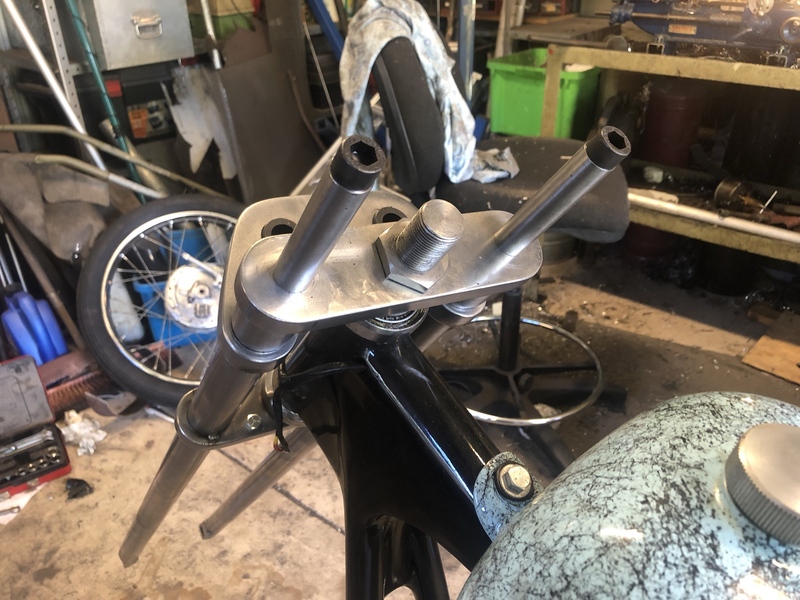 Ok, so everything fits, no issues, haven’t got a pic handy but I also tacked on the brake arm boss inside the left leg. 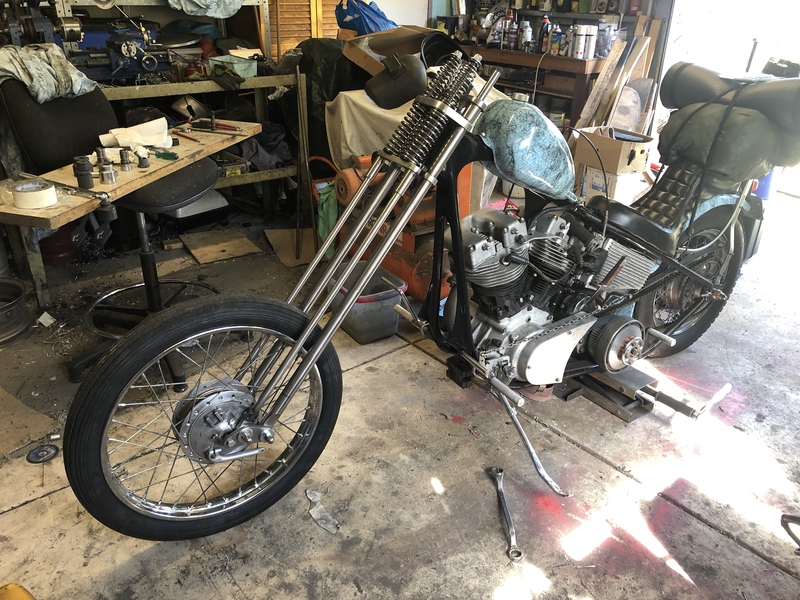 Pulled everything off again, tore down the springer and fitted the glide back up to the bike. 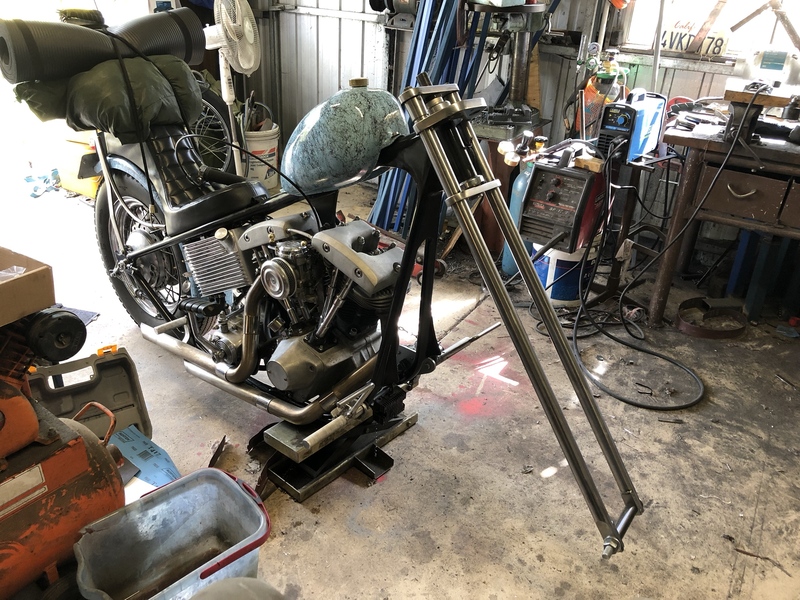 Now have a complete bike again and the forks are ready for welding. 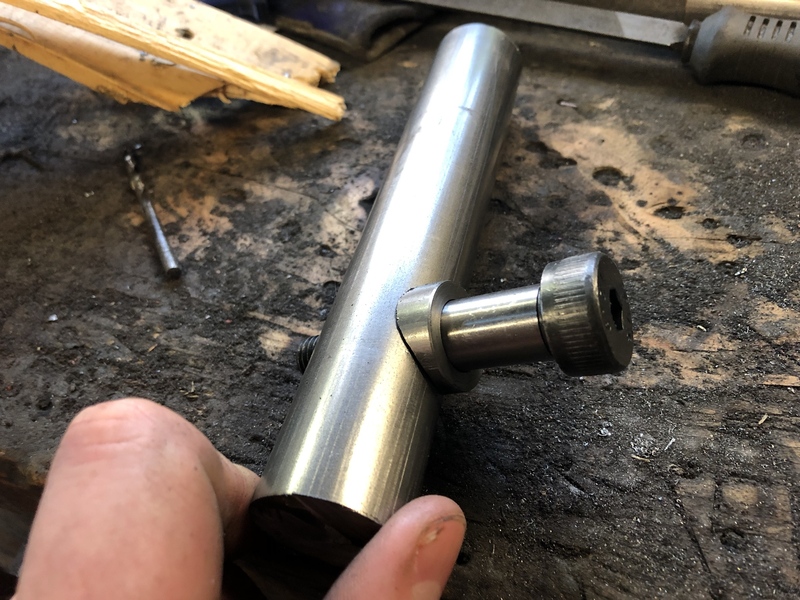 Have one small piece to finish before I drop the forks off to the welder, but need a lathe to do it so need to get that working again! 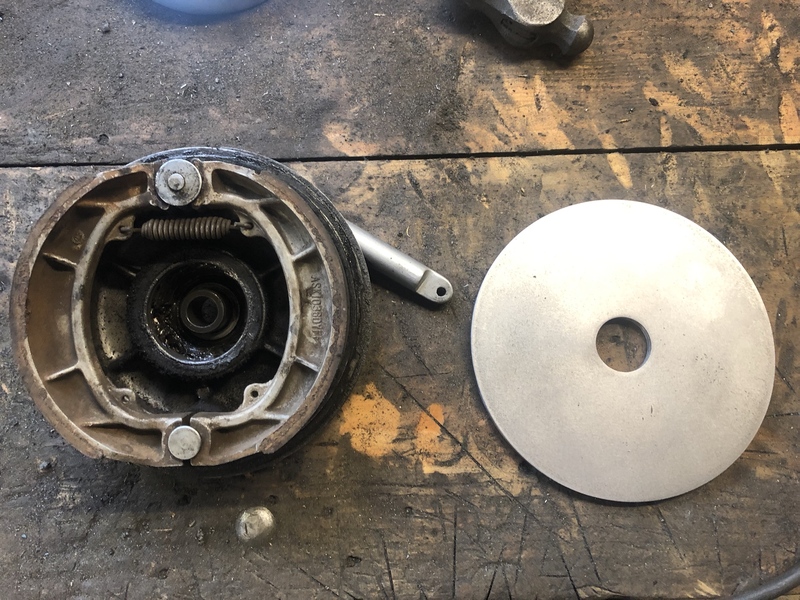 Lastly I’m going to fabricate a new brake plate for my hub, the original one has been ground down quite a bit and is probably losing a some strength now, plus is still taking up a lot of room. 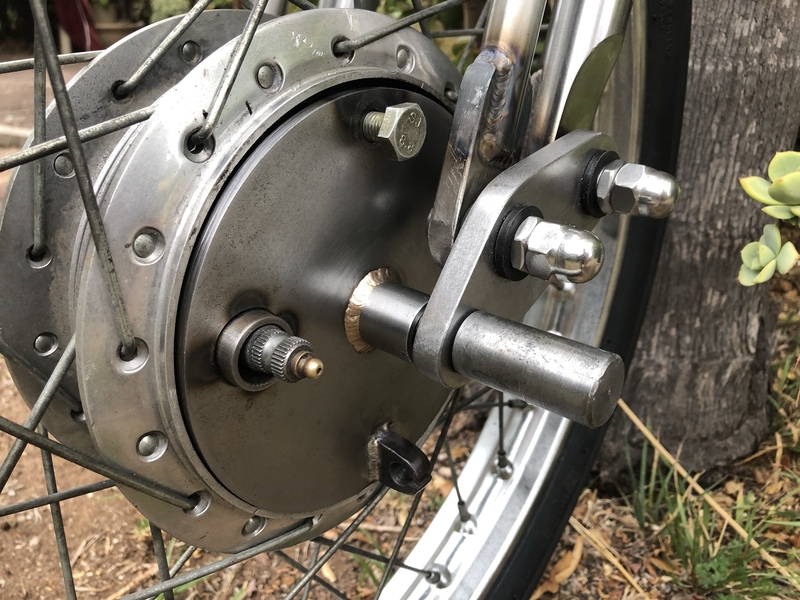 Speedo drive is in the way would be a pain to grind out and built back up again with weld. 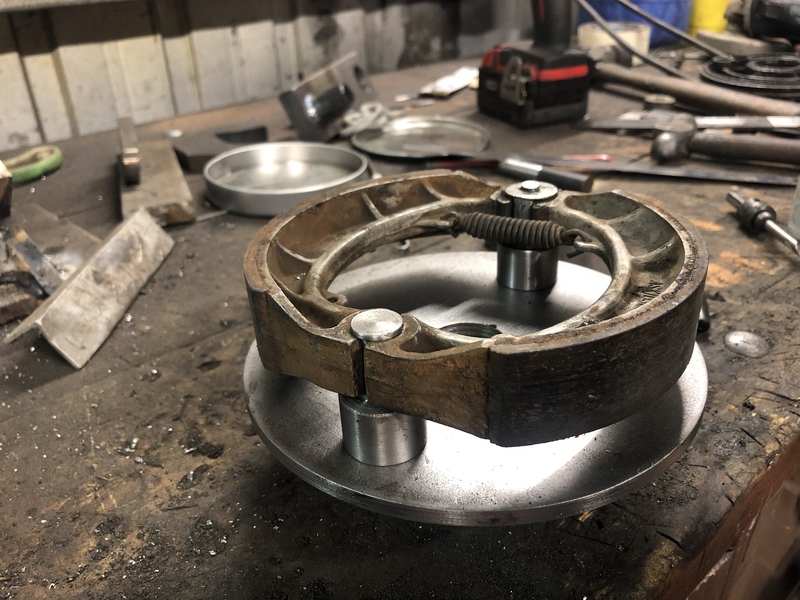 A new one will me made to suit the springer, with a large bushing in the centre so the axle can be pulled up tight and still have the brake plate rotate freely. I don’t know how many of you are following this, but I will continue to post progress regardless. No work on the springer as such, its been away getting welded and still needs a couple of things. Instead I have turned to the brake plate. My original one was too bulky in one particular area , and removing much more material could have left it weak, not to mention looking horrid. 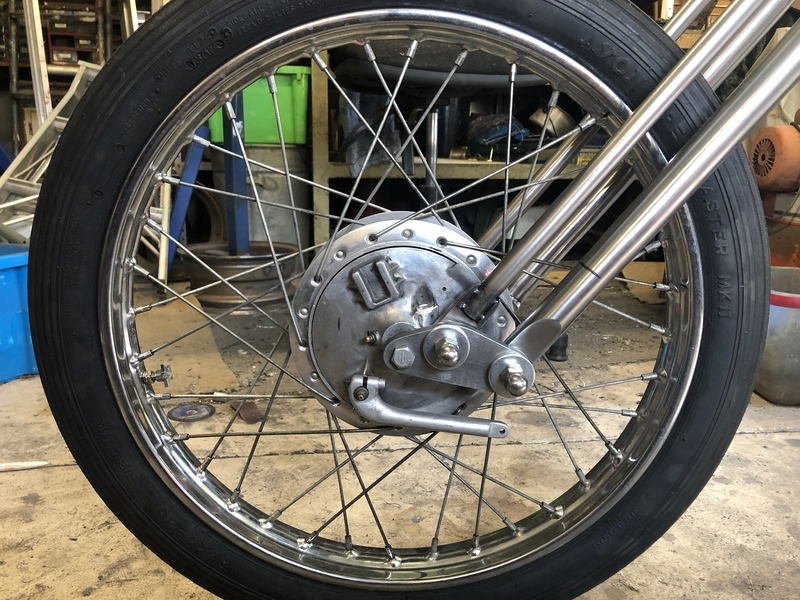 Drum brakes are have a unique requirement when run on a springer - you need to do the axle up tight like normal, but the brake plate still needs to rotate freely with the movement of the rockers. 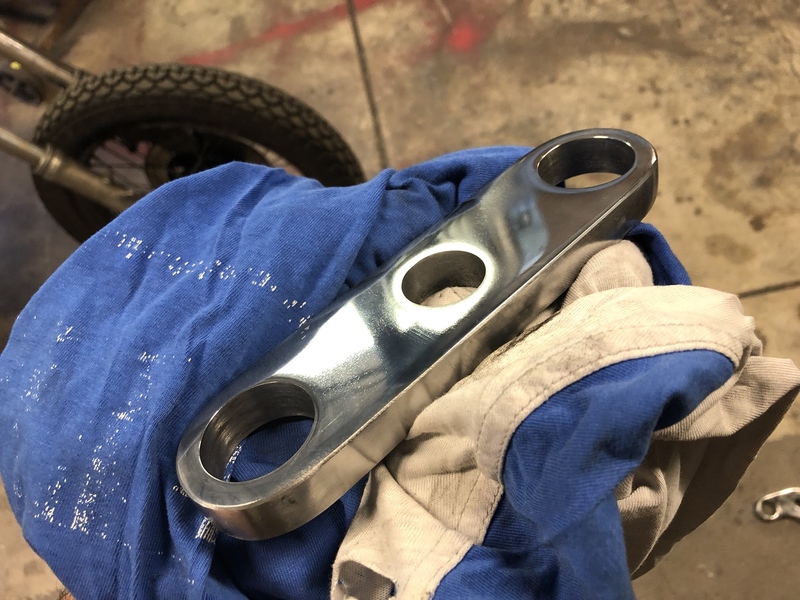 Figured it would be easier all round to fabricate a new plate in steel, simpler & cleaner looking, probably much much stronger, and I’ll get it chromed along with the forks. 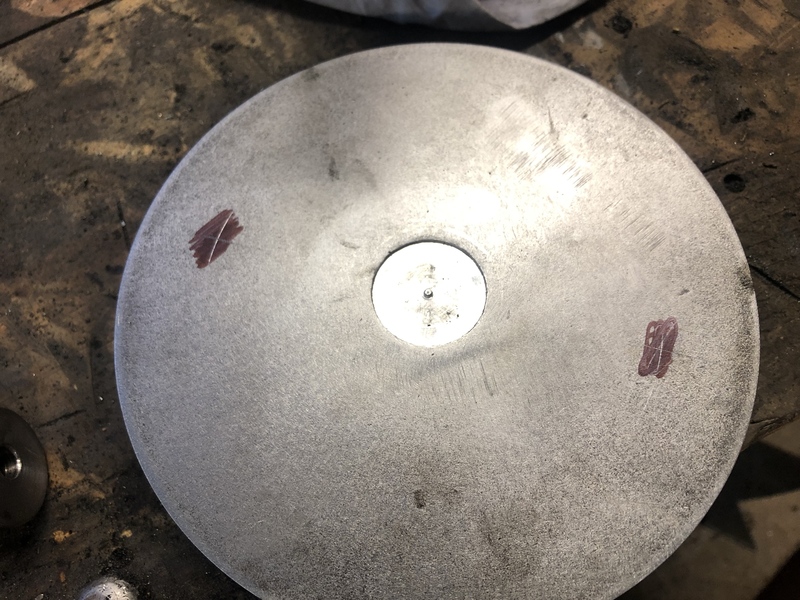 Disc of 6mm steel plate rough cut with the angle grinder, smoothed closer with flap disc. 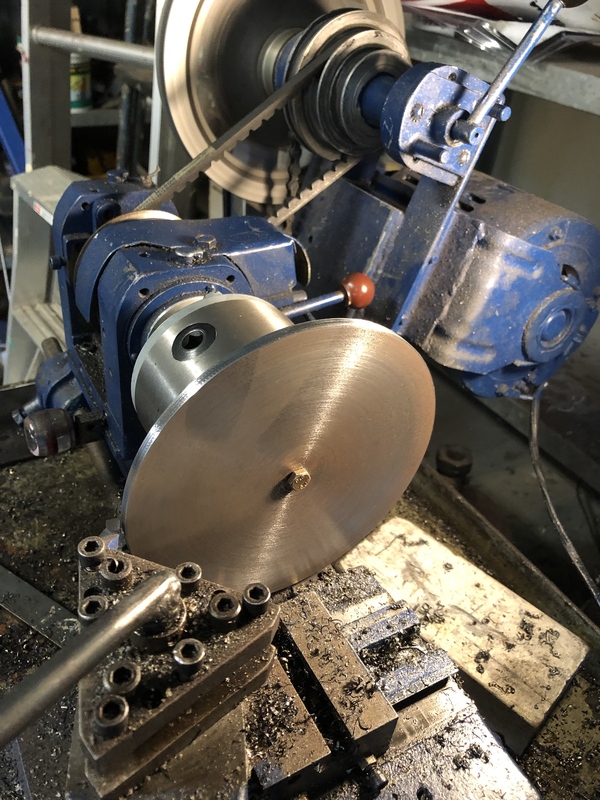 Disc mounted in lathe - only just fit!! Turn down the OD to be round and clean up the face with some emery cloth. 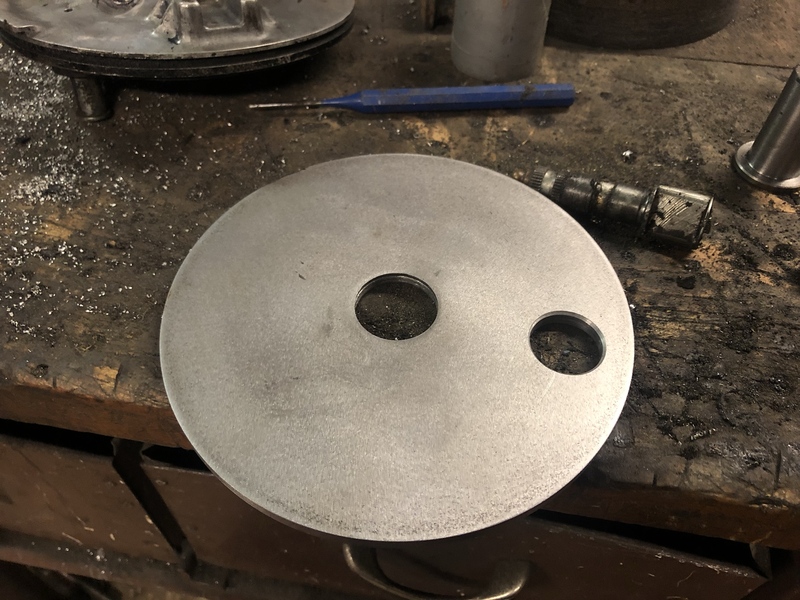 Centre hole drilled with 1.125” hole saw. Piece of sq tube and a couple of G clamps to hold the disc in place. Just noticed there’s only 1 return spring fitted.. mustn’t have had any effect on drum operation, it worked fine!! 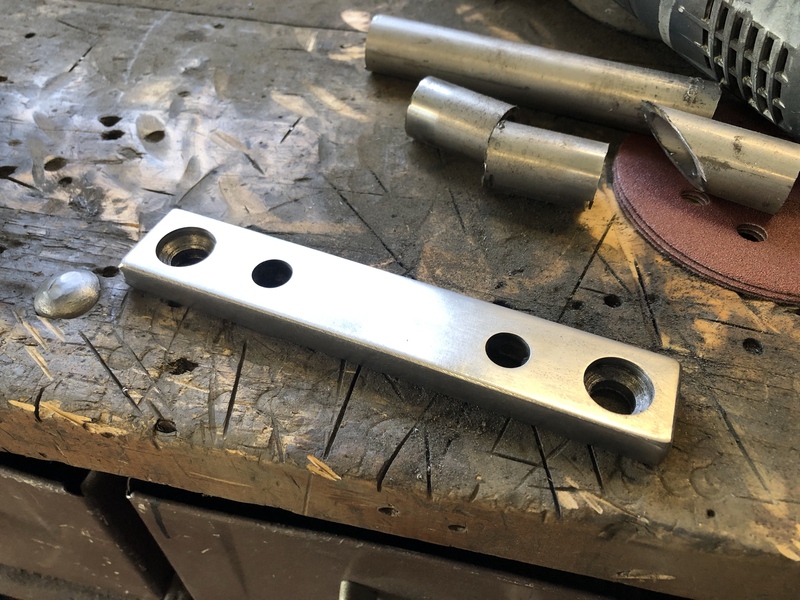 Sadly the brake arm I whipped up many years ago will be getting replaced with something a bit more suave. Now for the fun stuff. 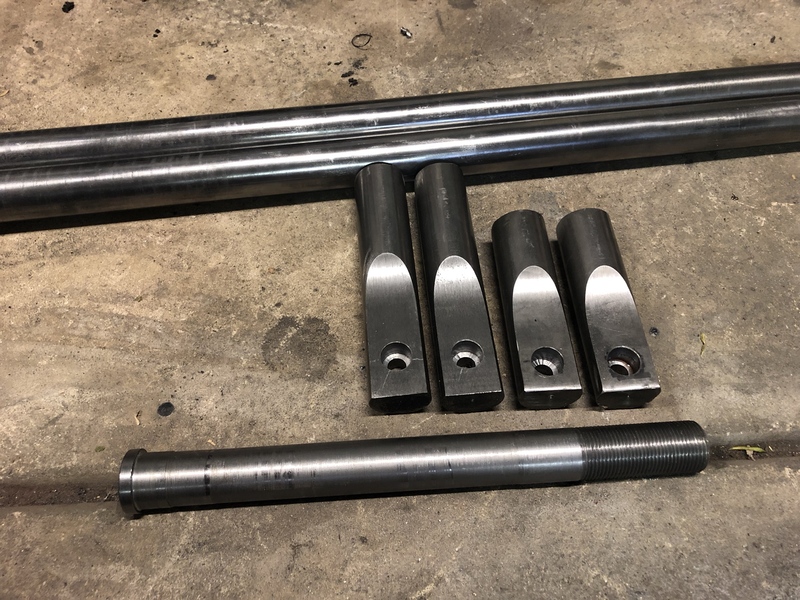 I machined some mandrels (?) to locate the centre of each brake plate, since I had already drilled a big ‘ol hole in it. 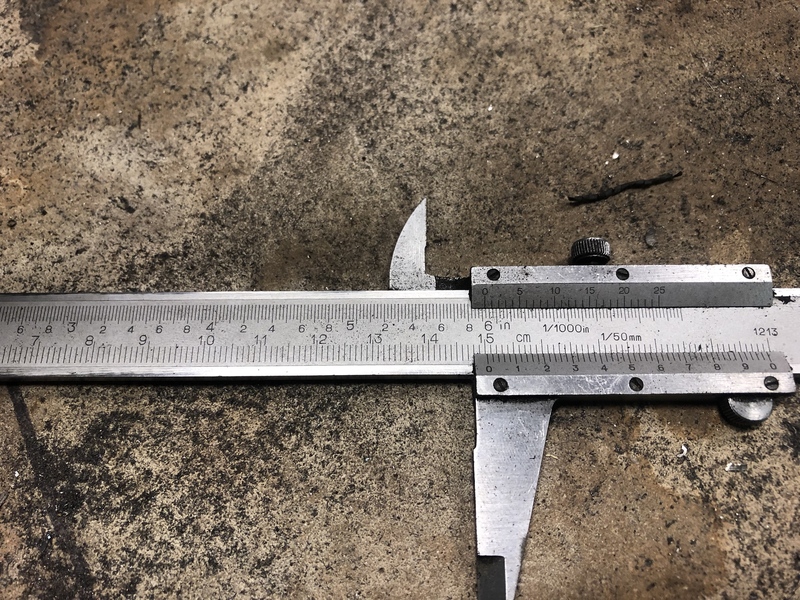 Using some calipers to measure the original distance between axle centre and brake shoe thingiebobs. Surprise surprise, both sides the same! 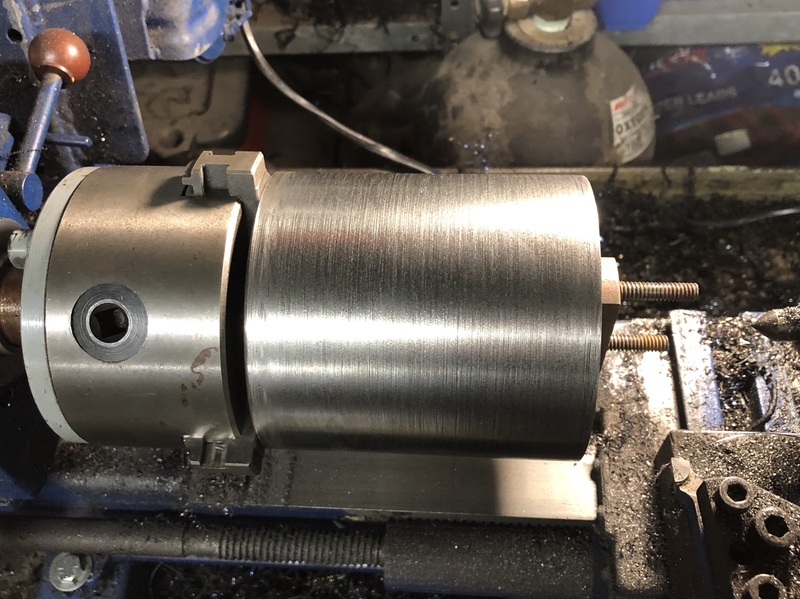 24mm hole for the actuating shaft housing. 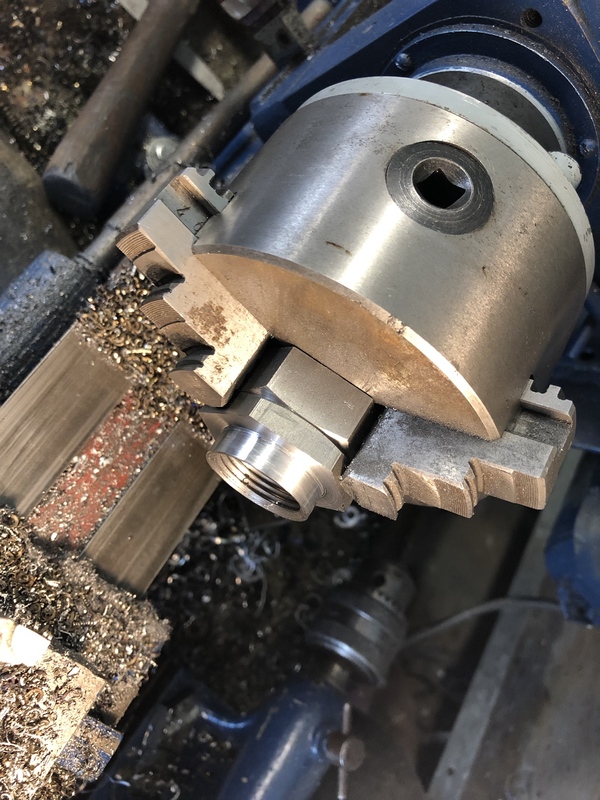 This done with a step drill, the housing is made from small piece of 1” DOM stepped down to 24mm in the lathe and pressed in. 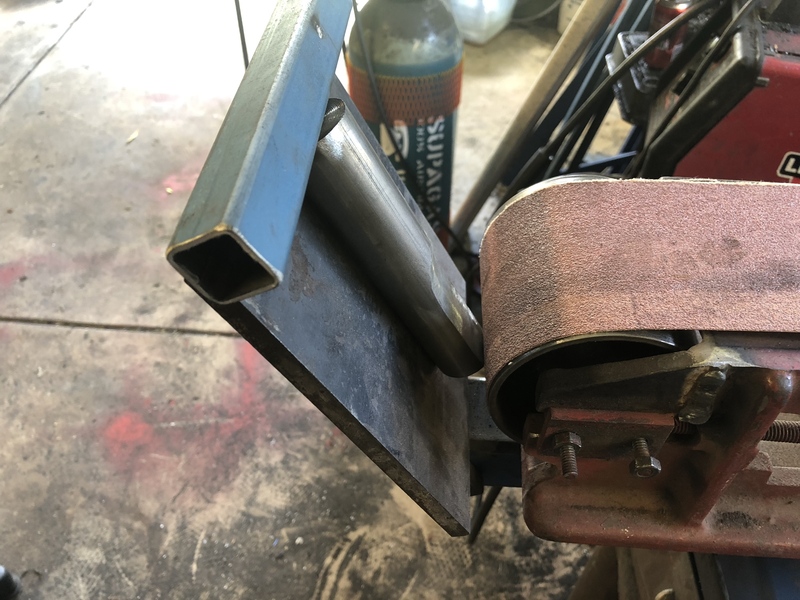 The step provides alignment against the brake plate. 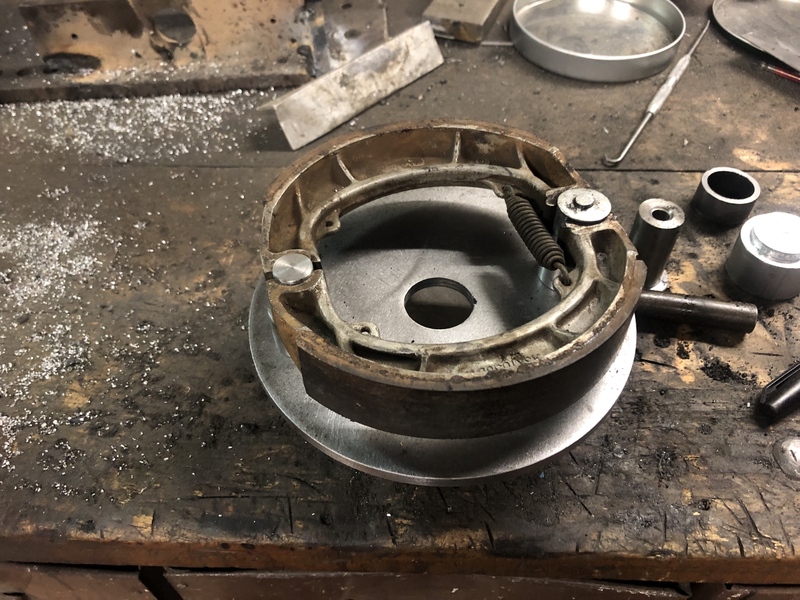 Here’s the shaft housing pressed in, and the fixed post that locates the other side of the brake shoes. Just turned from some 1” solid bar. This piece is to be welded on the inside, not at all visible from the outside. 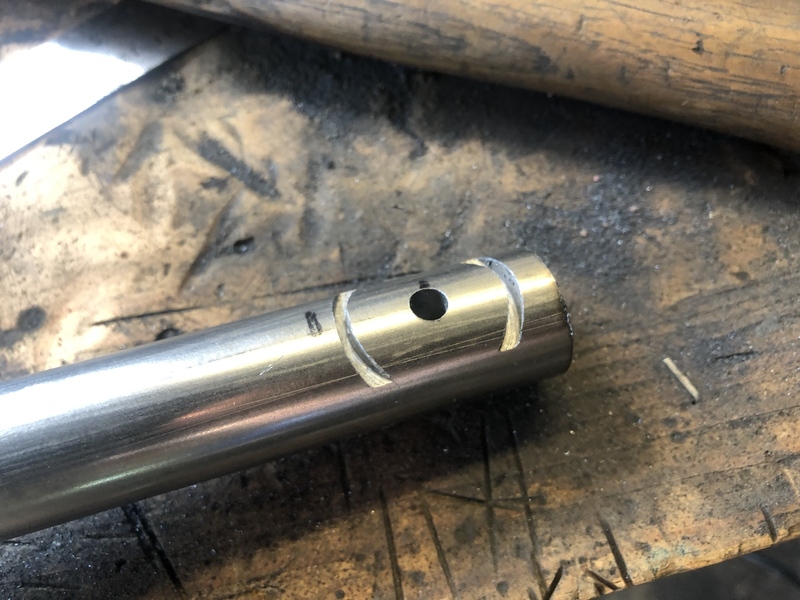 For alignment, I centre punched the location centre and drilled it out very slightly. 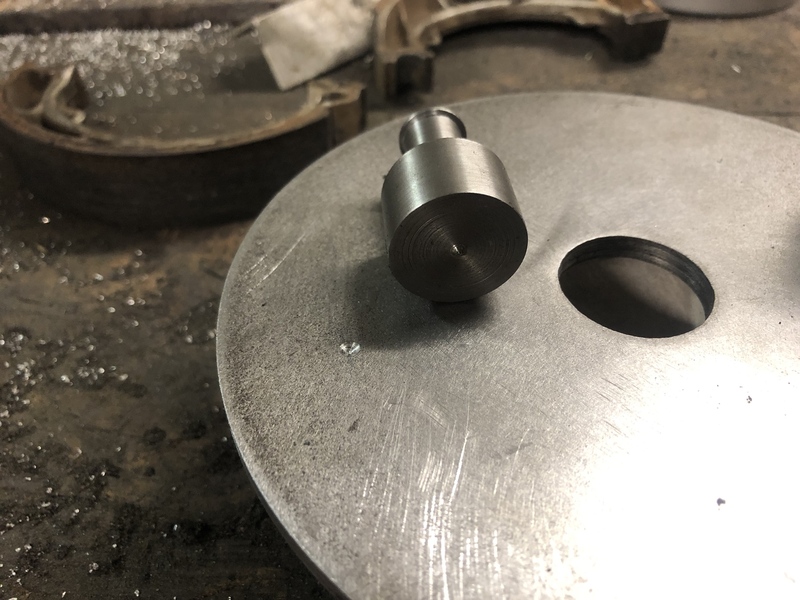 When machining the part to be welded, I left a small nub in the centre that locates into divot in the brake plate. These two bits are for the plate centre. 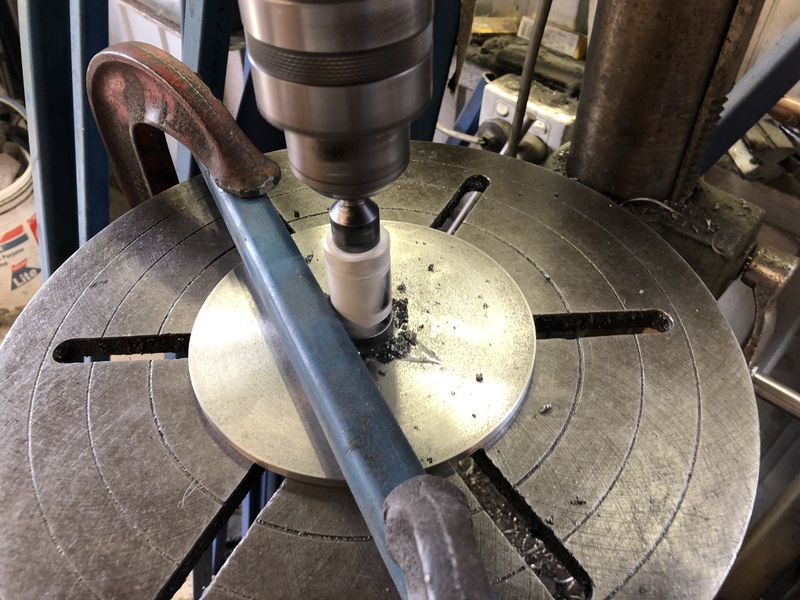 It’s 1.250” DOM, stepped down to locate into the 1.125” centre hole. Again this is for alignment. 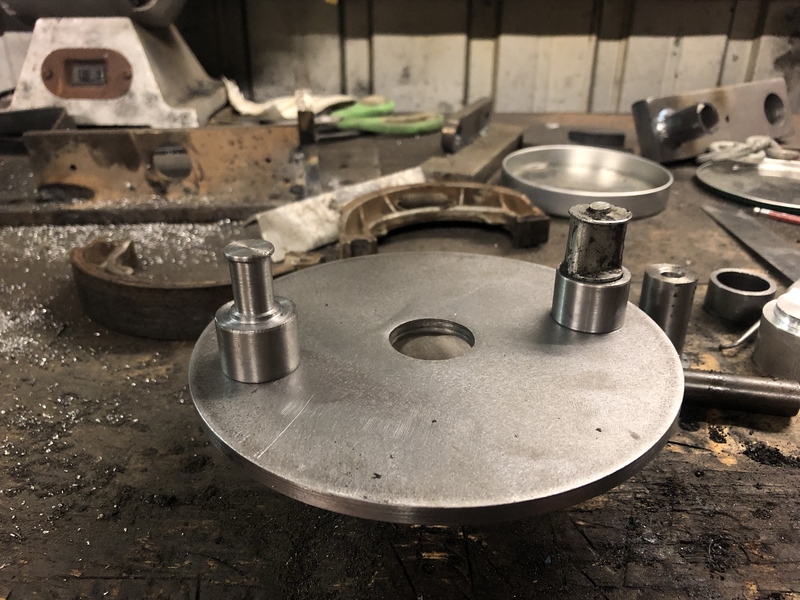 Later a large bronze bush will be machined for this to rotate on. 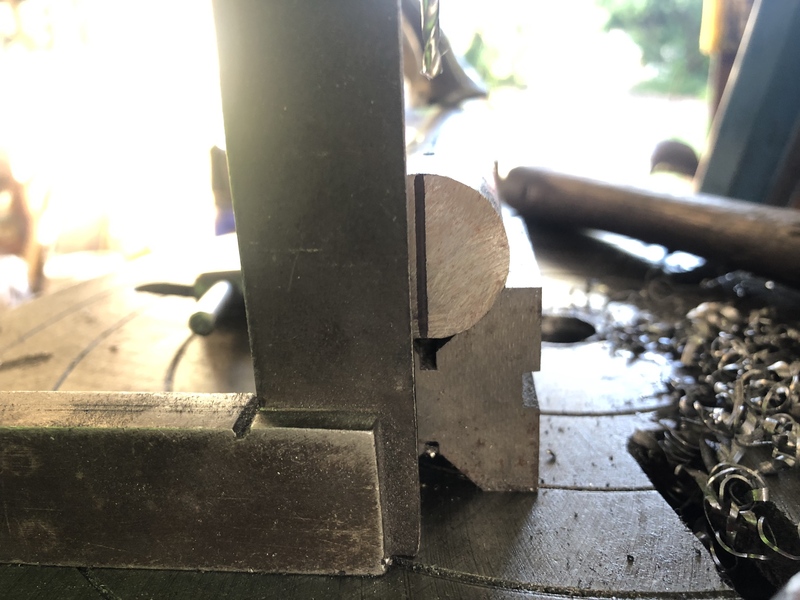 Both pieces are left intentionally long, as once it’s all assembled I can mount the whole thing in the lathe and fine tune the length to get the shoes where they need to be in the drum. 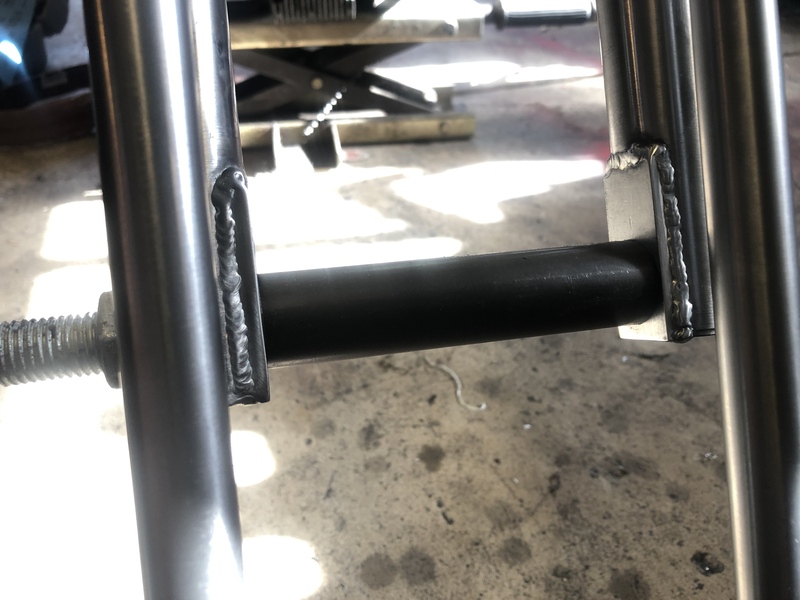 Not ready yet, but this is how everything will be welded. 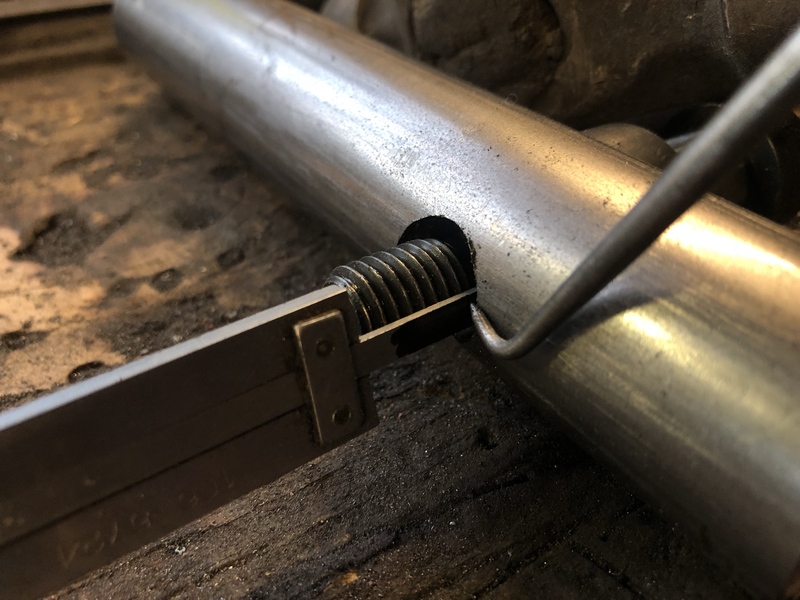 Bolts pulling things up tight and a clamp on the post, will be TIG welded for cleanliness and minimal distortion. That’ll all I got for today, but cooler weather means much more workshop productivity. I’ve lost so much time with the extreme heat over the summer, but full steam ahead now ! Looking forwards to seeing how it all turns out. What do you plan for the anchor. 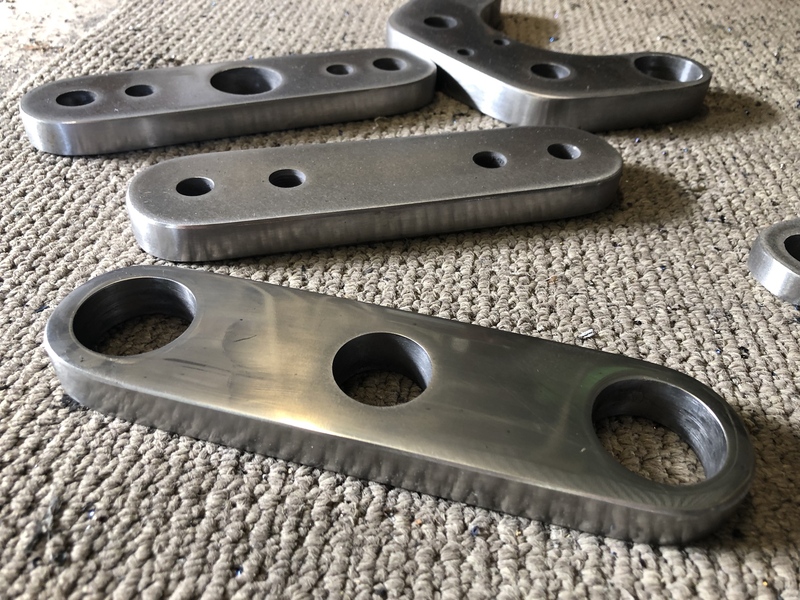 While I think of it, anchor length (centre to centre) should ideally be same as axle to rear pivot length and distance of each location point the same. If the rear location is higher will increase the dive on braking. If less will reduce dive. Sure you know that, but thought it would be of interest to readers. 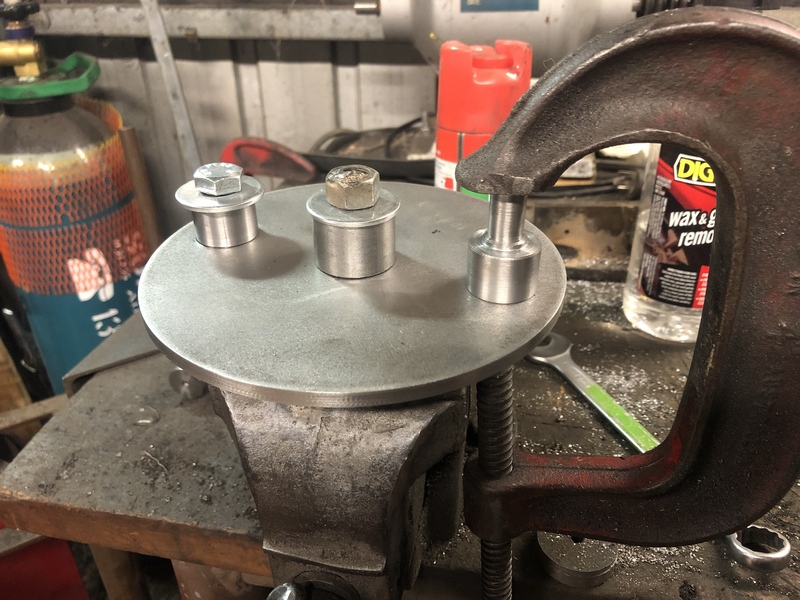 For Brake arm I am going to use some Heim joints, but with a bit of custom massaging. This is custom after all! Hadn’t considered the length of the arm but that makes sense too. 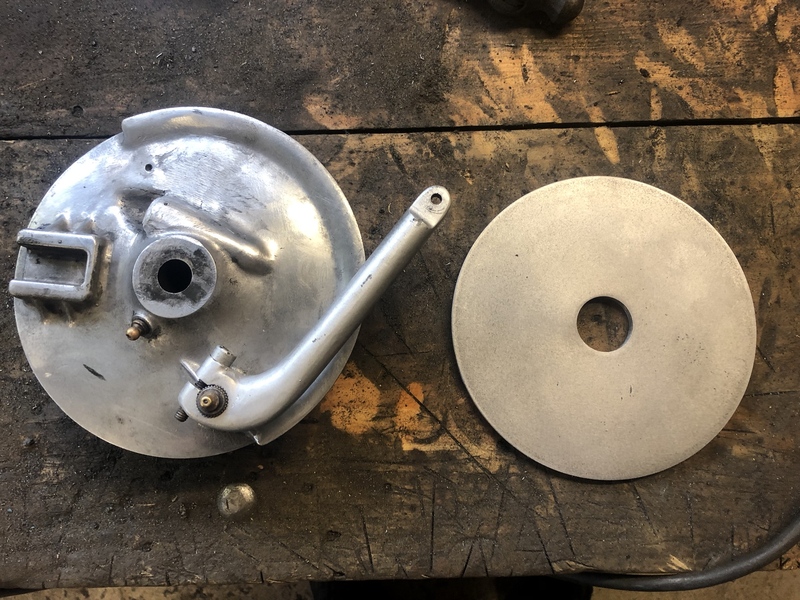 Intent of the new brake plate is keep everything as simple and clean looking as possible, I will be mocking up the wheel in the forks before decideing on clocking of the plate and position of the brake arm mount and cable holder. Pics to show but brief words from my weary head. 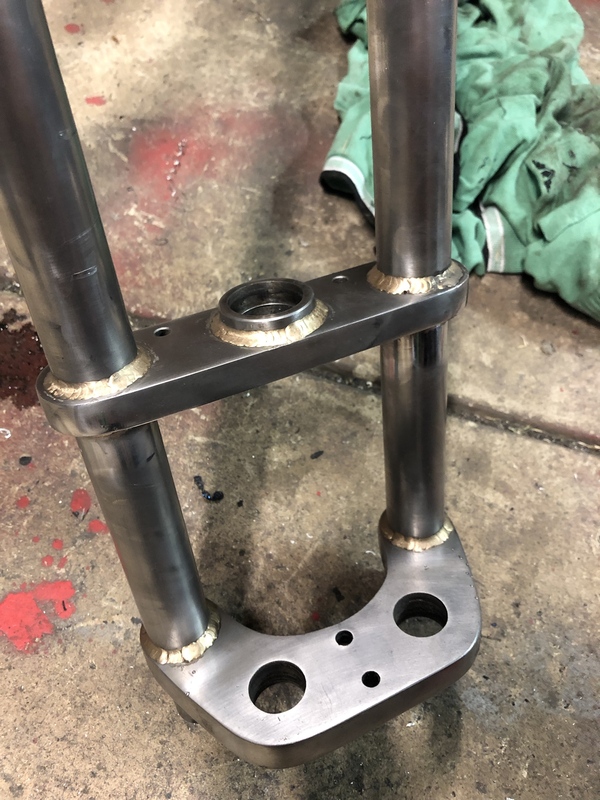 All back from the welder, mostly TIG Brazed. A really good process as it has such low heat input and almost zero heat affected zone. 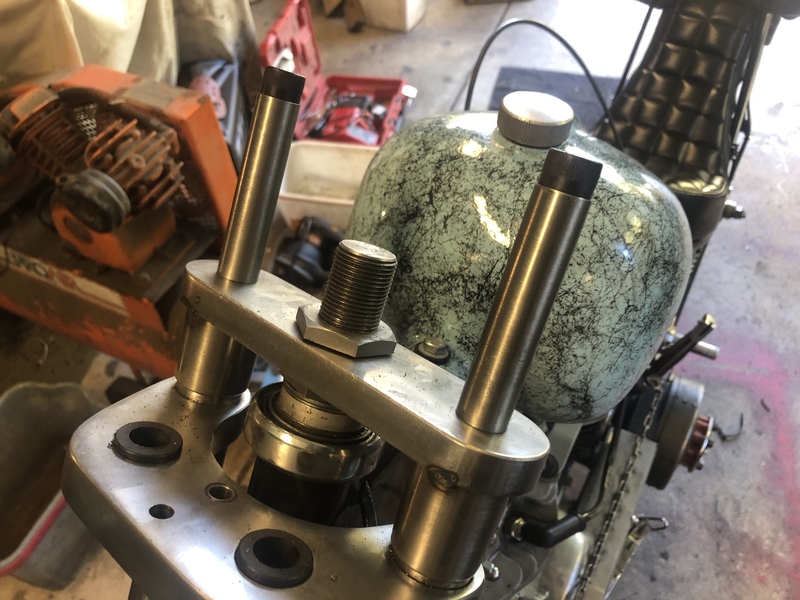 It is not suitably for everything but the design of this springer is perfect for it, as the ‘welds’ really have minimal stress on them. 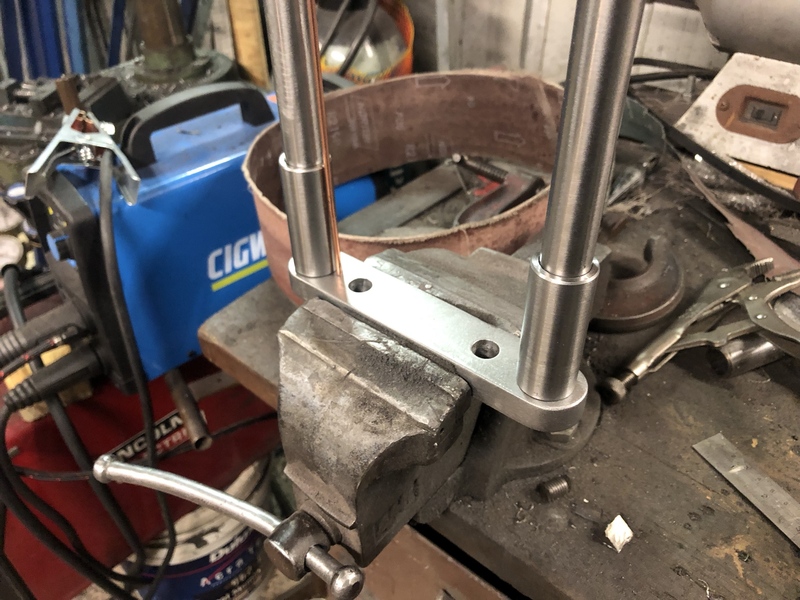 Front leg drop outs were steel welded as some extra strength was required there. 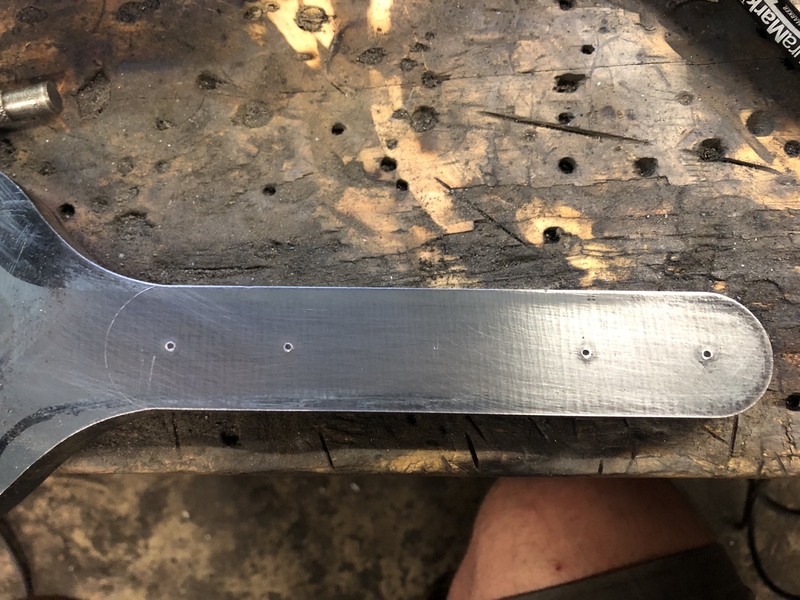 V2 of fabricated brake plate. Made some changes that should work out better. 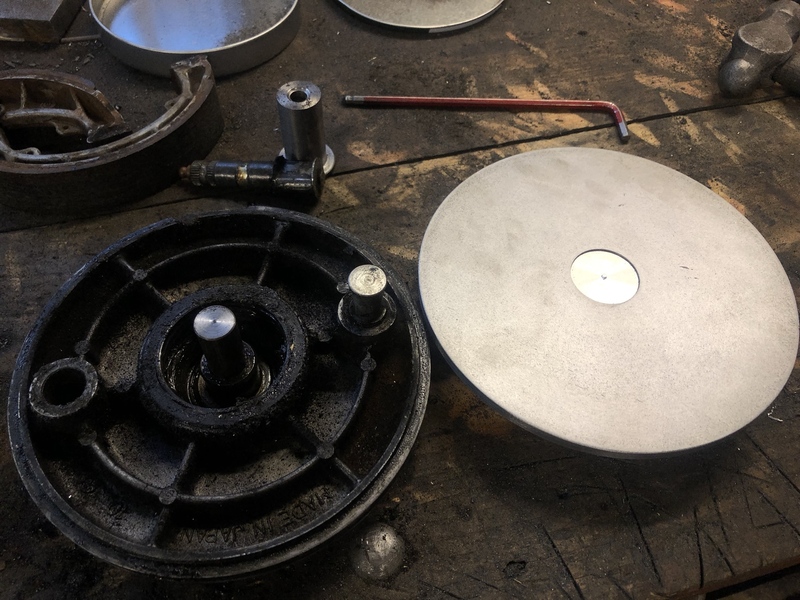 Need to fabricate bush for the actuator shaft and a tophat bush for the whole plate to pivot on. 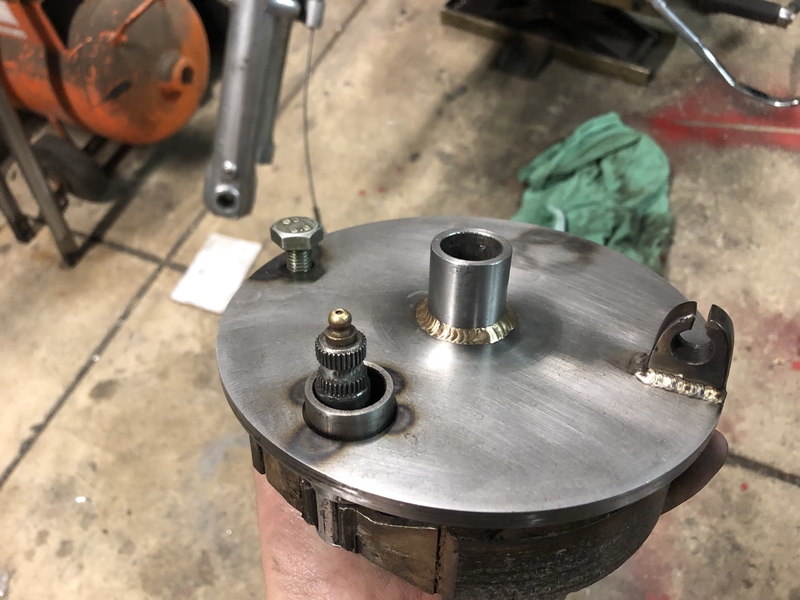 V2 of the brake torque arm mount. Despite my best estimates, I got the original design wrong. It was fine under most conditions but would fowl the hub at full compression. 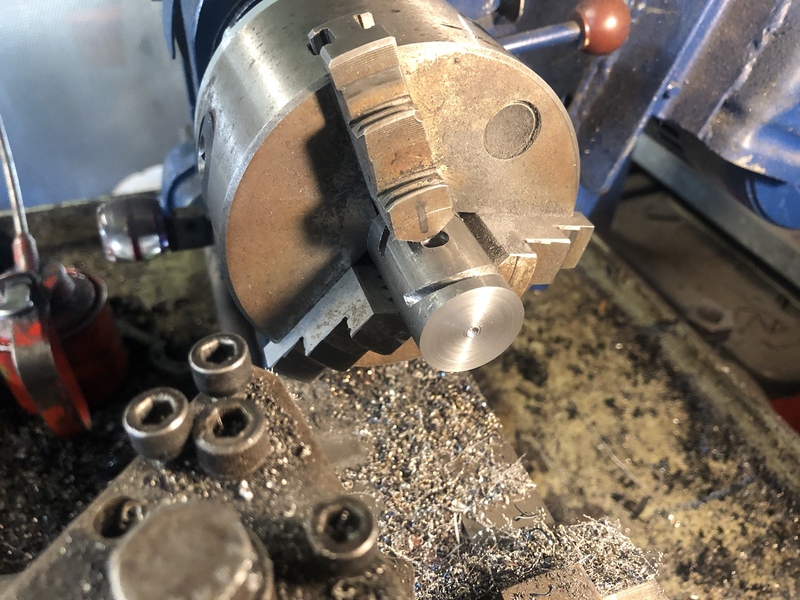 Have begun the long and arduous task of smoothing out the brake joints. I wasn’t planning on doing this, but it should make for a neat finish, I’m only doing it on the top sides of the main legs, and the front legs. Making slow progress, hard work on the hands using a round file. Used a dremel in parts as well. 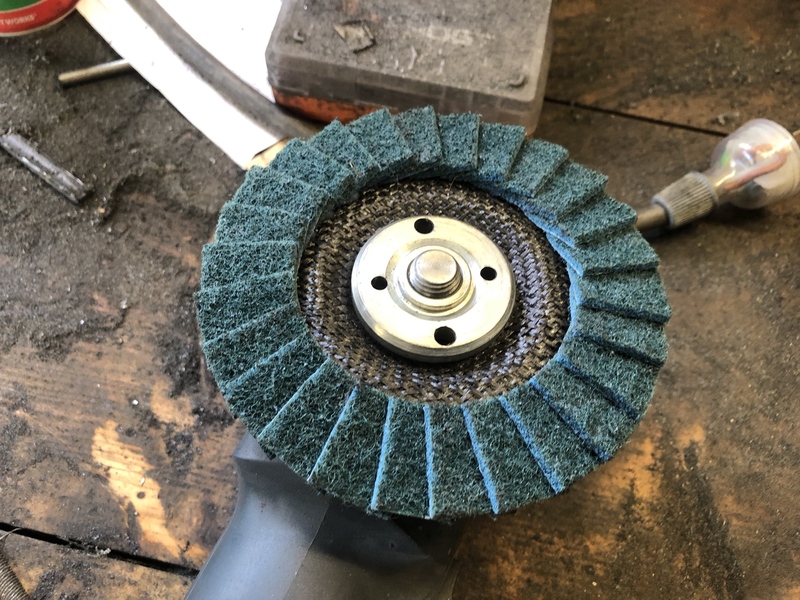 The final smoothing and polishing happens with a big buffing wheel. The underside as it will probably stay untouched. Maybe polished down slightly to level the high spots but still without removing too much material. But it works! 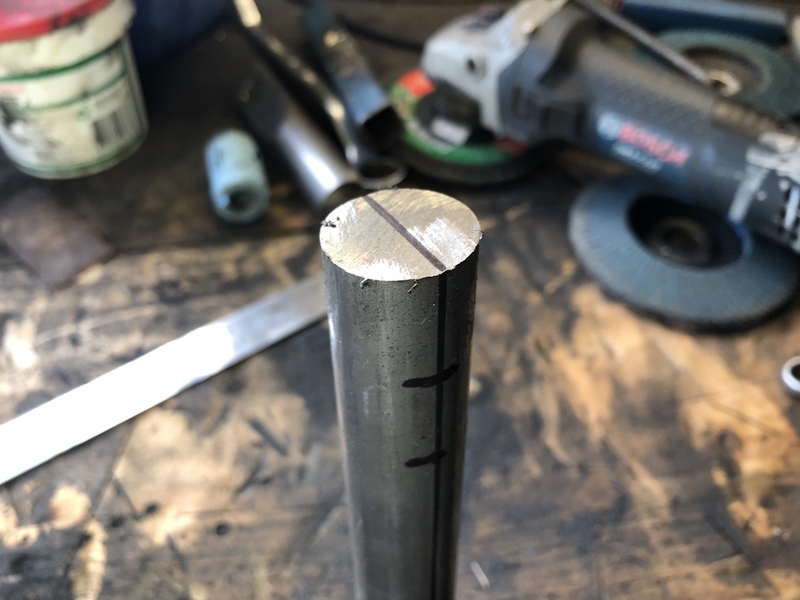 This was just a test and you can see some ridges on the edge of the braze that has since been smoothed. Unfortunately my sloppiness with the file means I have to go back a refinish the top tree before chrome. I’m getting good at that process though by now. Wow how good does that look with a polish! Incredible amount of work that you've put into this, but so worth it.